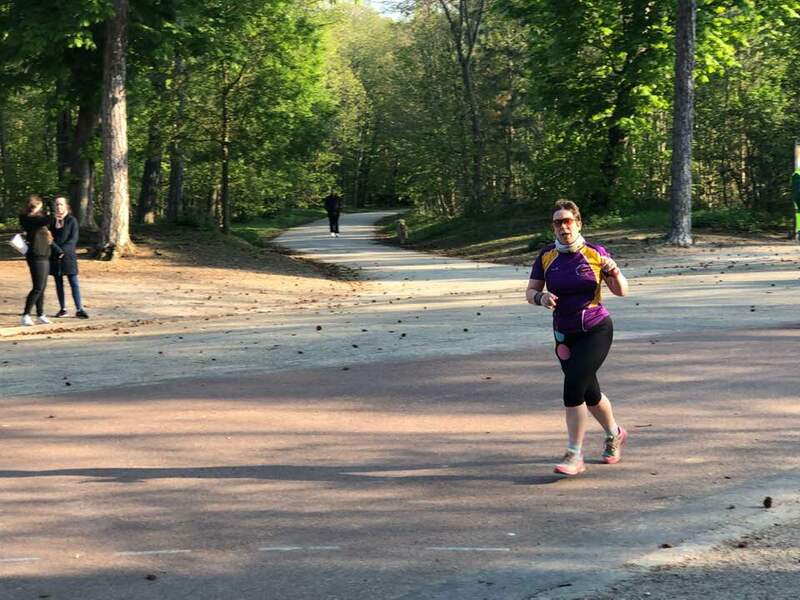 parkrun #242 event#58 Reason for visit: to regain regionnaire status! Now I was tempted to attend the inaugural last week, as my mate Ronan was celebrating his 250th run. But instead I chose to capture a missing Wilson Index number at Deerpark, Carlanstown , and I’m very glad I did! One of my fellow canicrossers turned up at Stran, to be informed that it is a “no dogs” course, cos Rules, which he was rather miffed about. And I would have been also if I’d given up catching my WI9 and then discovered I couldn’t run with Minnie. Anyhoo, I let them get their inugural out of the way, and atteneded event #2, which suited me to run without dog as I was heading off to a dance class afterwards. 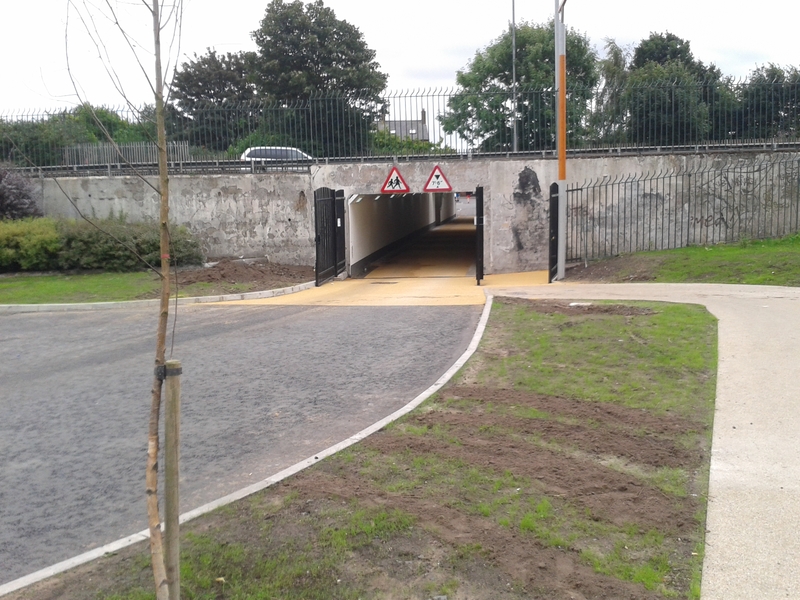 Runners are encouraged to park in the small car park at the roundabout. This has around 80 spaces, though some of the parking leaves a lot to be desired. One then trudges up the Famous Hill, past any amount of empty car-parking spaces which aren’t allowed to be used cos Rules. There is a Metro bus stop close to the entrance, 8A or 8D from the city centre – the 8.40 would get you there in plenty of time. The run starts and finishes behind the Orchard building. There are loos in here which are clean and warm, and I was able to leave my jacket under a table here too. After the run coffee and buns are in the cafe across the way in Central Bulding, which is currently doing a special offer for parkrunners. From the start it’s DOWN the Famous Hill, across the front of the big old redbrick building, and then up hill. And then up hill some more. A short spur to a turnaround point, and then more hills and more buildings. It’s all on tarmac roads, look out for the speed bumps, and there were a few cars driving about as well (at what seemed to me to be in excess of the 5 or 10 mph speed limit indicated). If you are running with headphones, make sure you keep aware of what’s happening around you. Three laps, and you can then pat yourself on the back for completeing a “character-building” course. I got the feeling it was a youngish crowd – even though my time was a rubbish 37 mins (I walked up the hills quite a bit), I was still 2nd in my age category. And the first female was an impressive junior with a time of 21 minutes. I bumped into a few fellow tourists, regionnaire and Wilson chasers. There were 118 people when I visited, and the wide paths made it not too bunchy or crowded. 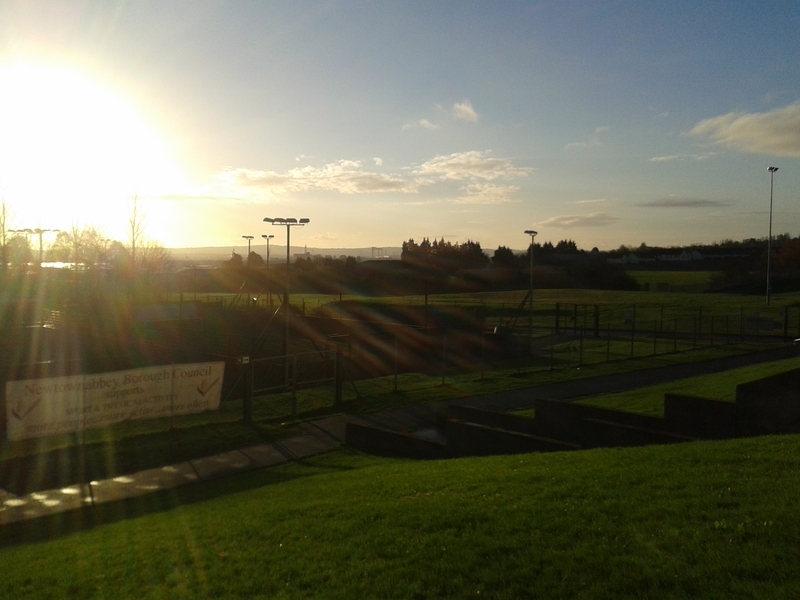 I have to admit, it’ll not make the Top Ten list of prettiest parkruns. But it’ll be popular with those completing their “I’verunalltheNornIrnparkrunssoIhave” collection, visiting students and professors, and those who live nearby. My Garmin couldn’t find a signal at the start. I was probably standing too close to big trees and tall buildings, and should’ve gone onto the playing pitch where some people were doing their warm ups. My headphones thankfully worked, as running without music would’ve been testing, and they are bone conducting ones so I could still hear what was going on – there was lots of encouragement from fellow runners. Since I was heading off to a dance class straight after, “Some Days You Gotta Dance” by The Dixie Chicks. My “elf’n’safety” meter was beeping loudly at the pre-run briefer standing on a plastic chair, the cars on the course, and a few extra marshalls would’ve been good, especially at the turnaround point, where the marker can get blown or kicked out of place, and also the surface there was a bit slippery and mucky. I thought I couldn’t see a tail walker, but photos and results seem to suggest that there was one, just not wearing the orange vest. And I’m going to need a teeny tiny bead to mark the spot on my Tshirt! Determined to regain my Norn Irn Regionnaire status, after missing the inaugural a few weeks ago, I headed to East Belfast. 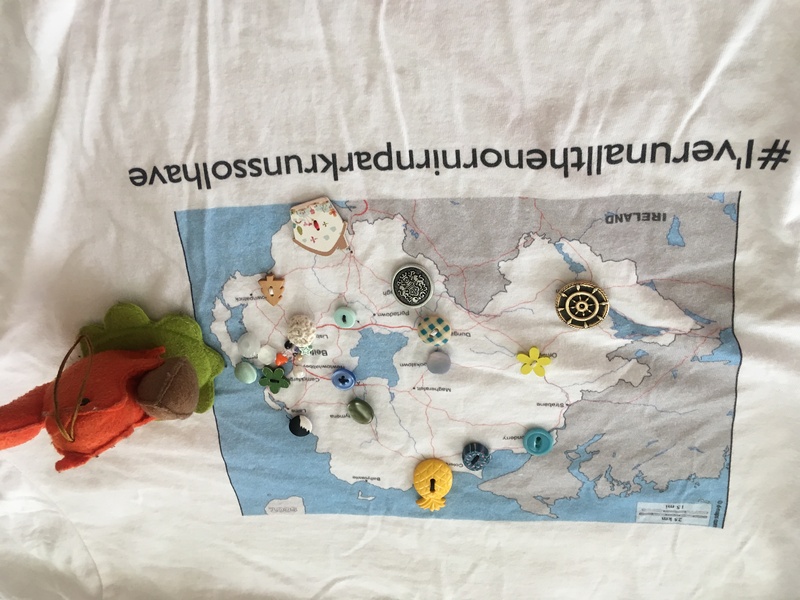 I’ll need to find a suitably sized bead to add to my T shirt. 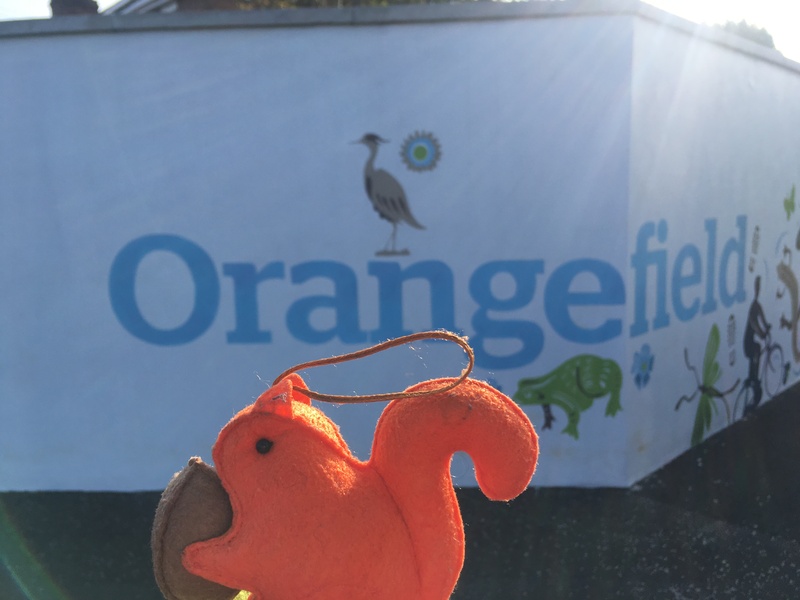 This is an area I know well, in fact one of my previous addresses was in Orangefield Crescent. Back then, when my children were teenies, we knew this park for its spider shaped climbing frame. 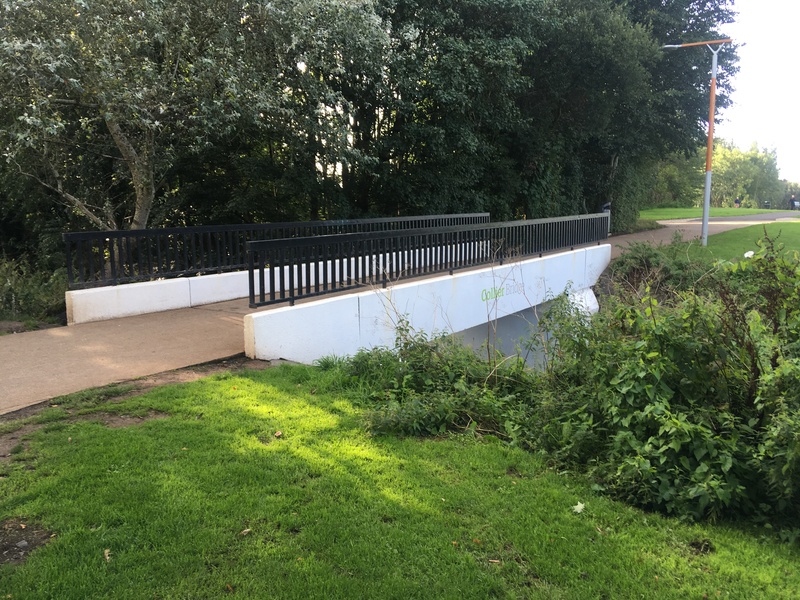 The spider is long gone, but the whole area has been very well revitalised, and the park is clean and tidy with some lovely bridges, each of which has a name. 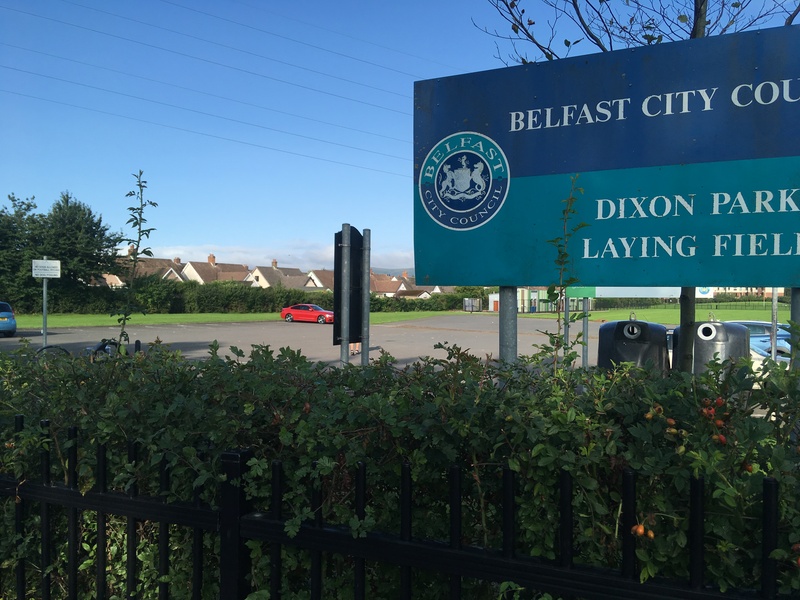 There’s plenty of parking spaces across the road at the playing fields, and the 5A or B metro bus will leave you pretty close from the city centre. 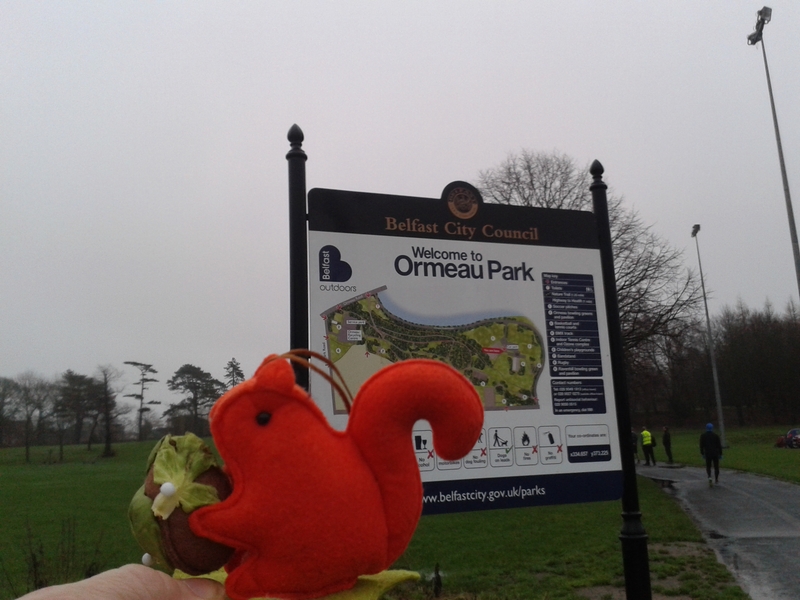 This is Belfast’s 9th parkrun, so visitors will have plenty of options. 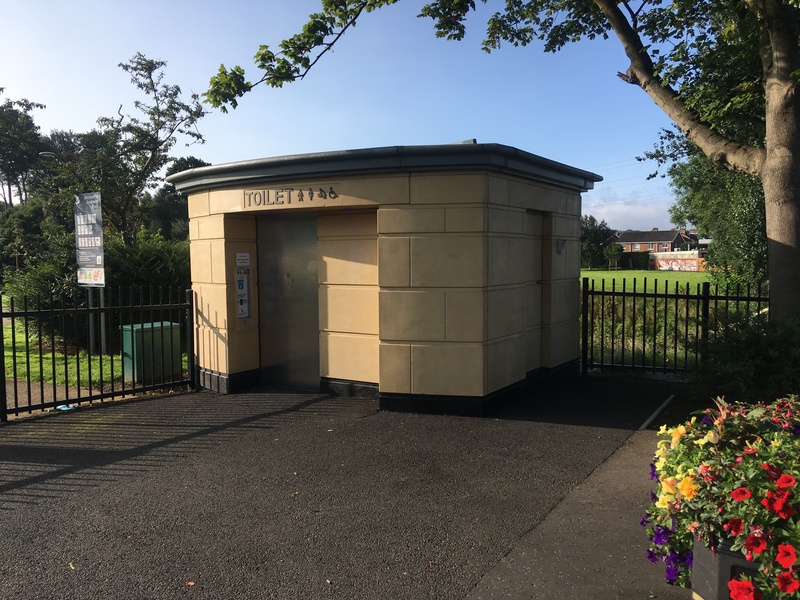 There’s a loo by the main entrance, but you’ll need 20p! (There’s a big Tesco not far away on Castlereagh Road that you could try). There’s no sheltered spot to congregate in, so no teas/ coffees so far. There were just over 100 runners the day I visited, which is a nice size. Good age range too, with lots of speedy younsters, and some sprightly older people too. A few buggies and doggies, and some walkers, give it a good diverse feel. It’s one small lap and then 3 larger ones. This can get a wee bit confusing, so it helps to count how many times you’ve passed a certain bridge or other landmark. The paths are a good hard surface, and some of the course goes through woodland so it’s trail. The first lap can get a bit bunchy, but there’s plenty of grass to the sides for overtaking. And by the time you’re on lap 3, most of the fast guys have finished, so there’s a bit more room. It’s not totally flat, but the hilly bits are nothing to fear. The final stretch is across grass into the finish funnel. I revisited a few weeks later, and the course has been altered slightly, and now doesn’t run on grass at all. I suspect the earlier version was a leeeetle bit short, and so I didn’t manage a PB. 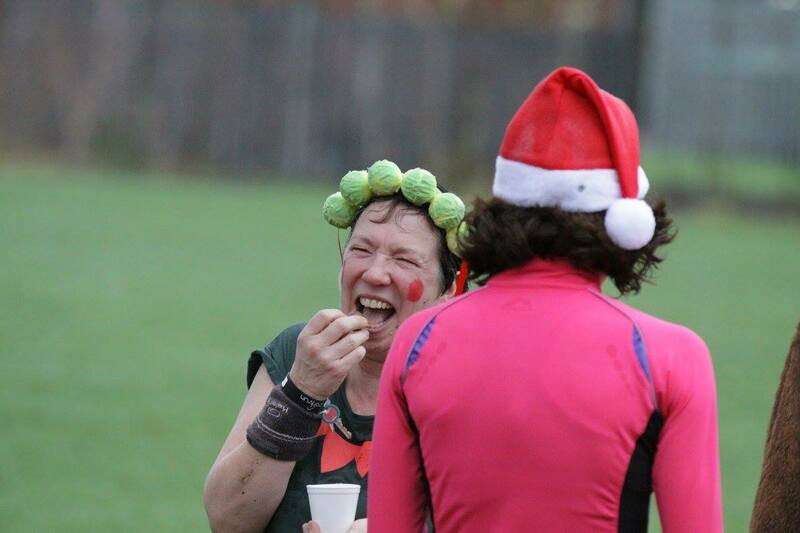 But I DID manage to grab the final seconds on my “parkrun Bingo” so the lack of PB was worth it. Honest! Thanks to my daughter for the action shots. I tend to run without headphones these days, so I wasn’t listening to anything during the run. But I was singing loudly to The Dixie Chicks and “Some Days You Gotta Dance” in the car. I wasn’t pushing myself to the limit, so I was really pleased with a 28:27 time, my fastest since February this year. I’m sure I’ll be revisiting at some stage to try to sneak a cheeky wee PB. This was a last minute decision. I’d been chatting to Andrew Johnston of Andrews Animals . 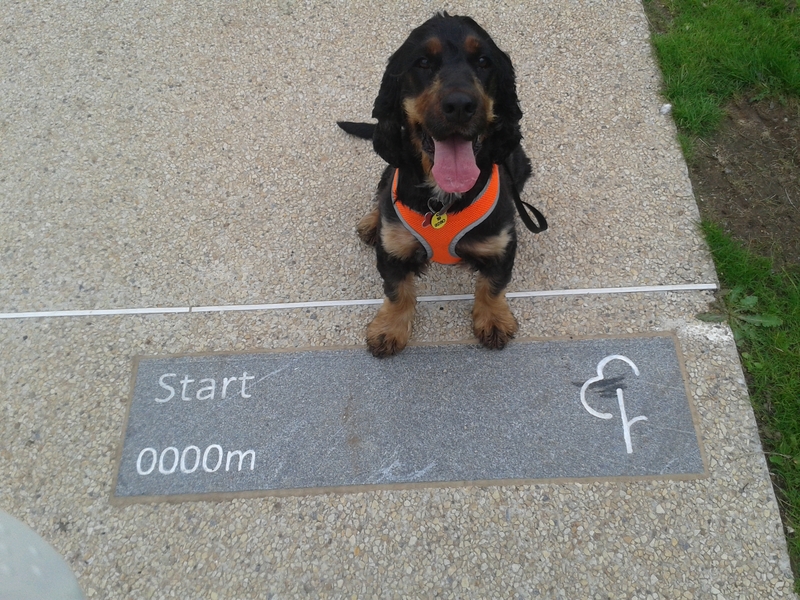 We’ve met a few times at parkruns and Waggy Races. 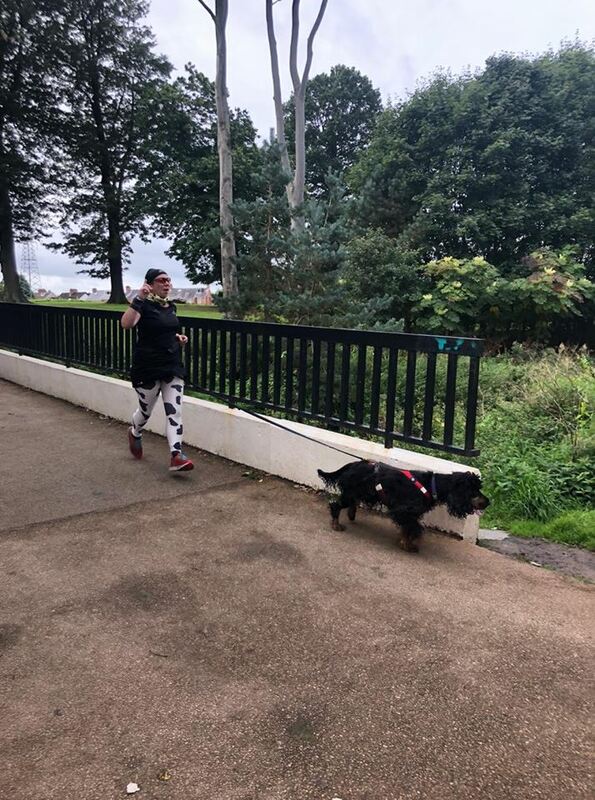 We’re both members of the very exclusive IverunallthenornirnpakrunssoIhave Club, AND members of the “My running companion is a dog called Minnie” club. 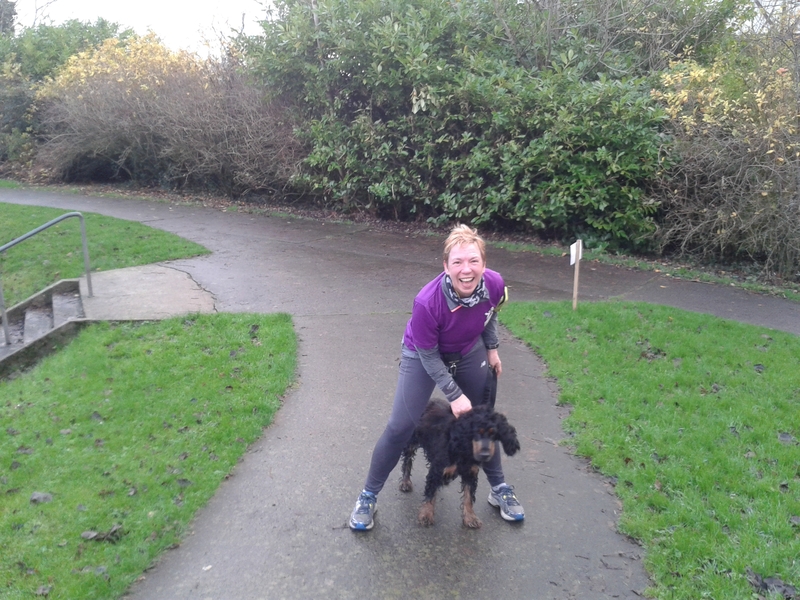 He had a dog training thing to do in Antrim, so we agreed to meet at their parkrun and have a Minnie-race. But thank goodness he did a last minute check to see if the event was on…..and it wasn’t! There’s a fair on in the grounds of the park, which means the parkrun was cancelled for 2 whole weeks. Funnily enough I’d bumped into some Antrim runners the previous Saturday in Enniskillen, as we modelled our hot-off-the-presses 100 shirts. And as I was there for a weekend’s Scottish dancing, I modelled my tartan leggings, which earned me the nickname “The Flying Scot”. This blog’s not called Dancing At Lunacy for nothin’, ya know! Anyhoo. No Antrim. But I remembered that Tim Page was going to be at Queens that day, so it seemed a good time to go and meet him. 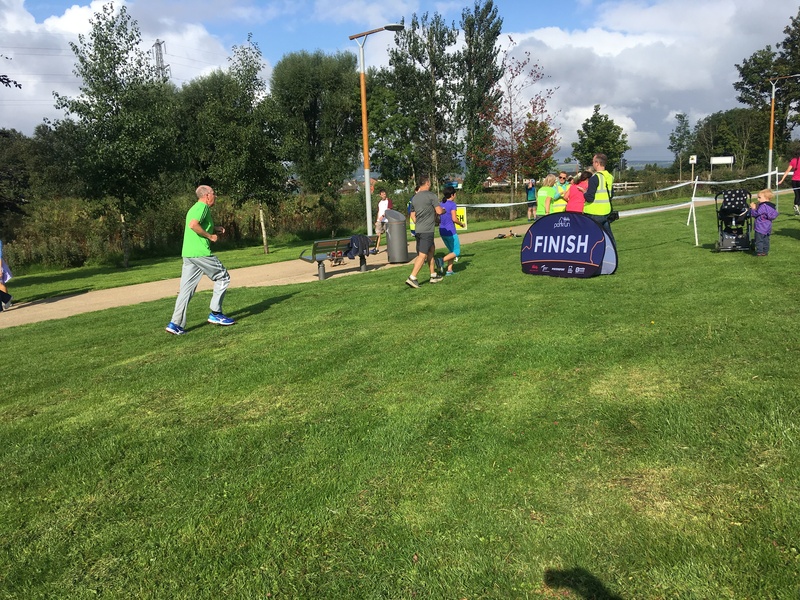 Tim is a 4 time cancer survivor who is running all 22 of NI’s parkruns to raise money and awareness of leukaemia and lymphoma research. I’d read some of his earlier run reports, and followed him on Facebook, and was delighted when he come out of the door at Queens and greeted me and Minnie by name! We had a quick chat and admired my T shirt – I’ve promised I’ll make him one too, when he completes his journey at Stormont later this year. We agreed that each parkrun has its own little personality and quirks, but the over-riding common feature is the support and warmth. It’s so much more than “just” running. I wore my muscle leggings, which always attract a smile, and the weather was kind enough to hold off on the rain for a while. My first lap was pretty smart, but my pace ebbed away during the second lap, and I was about a minute off my last time here. 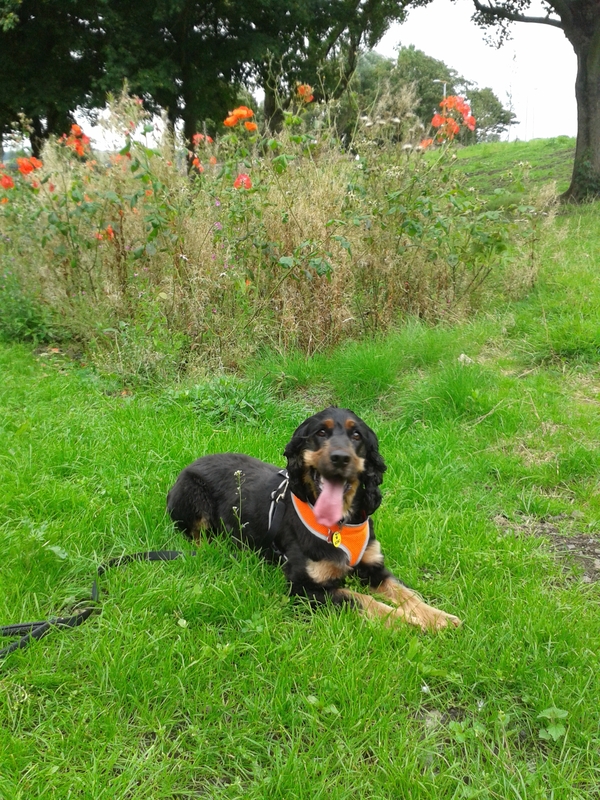 I tethered Minnie to the pup-park, where she actually behaved nicely for a change! And clapped and cheered the final runners over the finish line. I gave Tim a big hug and a well done, and he smiled and said “It’s good to be alive”. Having changed phones recently, my playlist was a bit different from the previous one, and the strangely-appropriate-song on this day was Talk Talk with “Life’s What You Make It”. Well, I’ll leave you with my own motto: there’s more to running than going fast. Please donate, follow and share Tim’s blog and fundraising page! 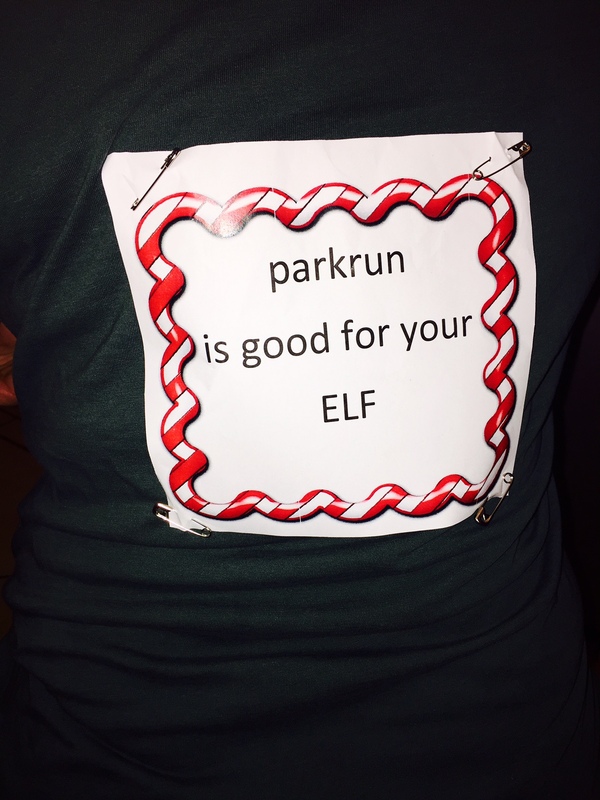 There is traditionally a parkrun Christmas Compendium, showing which events are holding a run on Christmas and New Years Day. 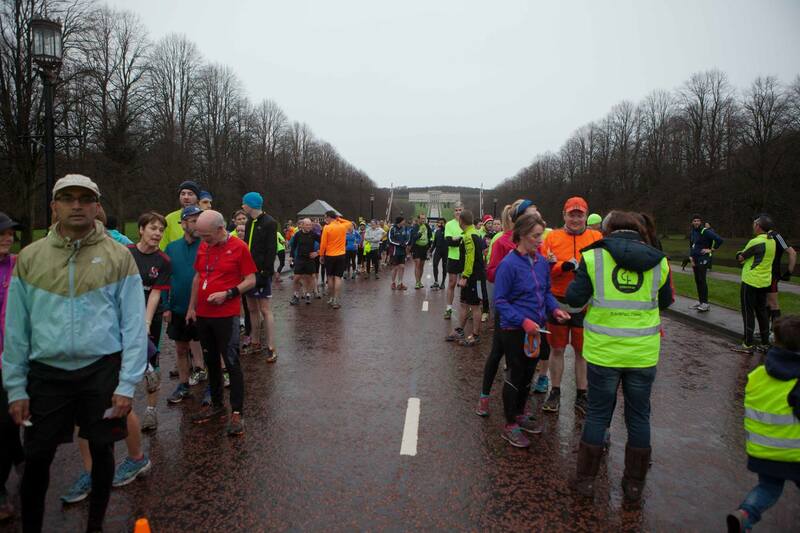 I learned that one of NI’s newest, Stormont, was planning to hold it’s NYD run at 11 am, to allow runners to complete a double, and also run an earlier one, both of which would count as “official” parkruns. An idea formed in my little brain! Now, you probably know that I’m partial to a bit of dressing up. 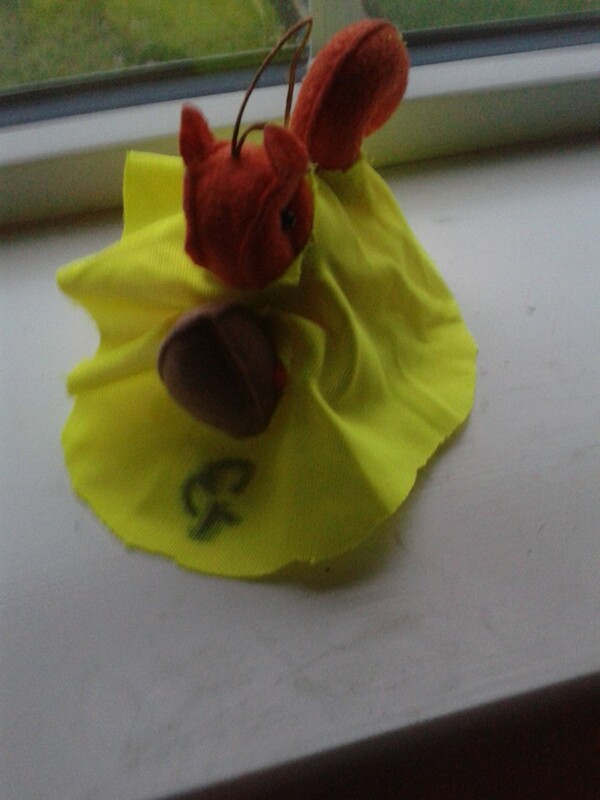 You also know that I participate in Scottish Country Dancing. For a dance dem, I had to have some festive headgear, and so I found a cute elf headband in poundland. To go with this, I acquired an elfy T shirt in New Look, and started trying to source stripey tights. The usual suspects on the high street proved useless, but I did find some black and white ones in Claires Accessories, where I also picked up a sprout necklace. While taking a short-cut (ha!) through TK Maxx, I happened upon the cutest “Christmas jumper for your dog”, so that was Minnie’s outfit sorted! Cracker the squirrel is usually holding a nut, but it was fairly simple to get him holding a sprout. 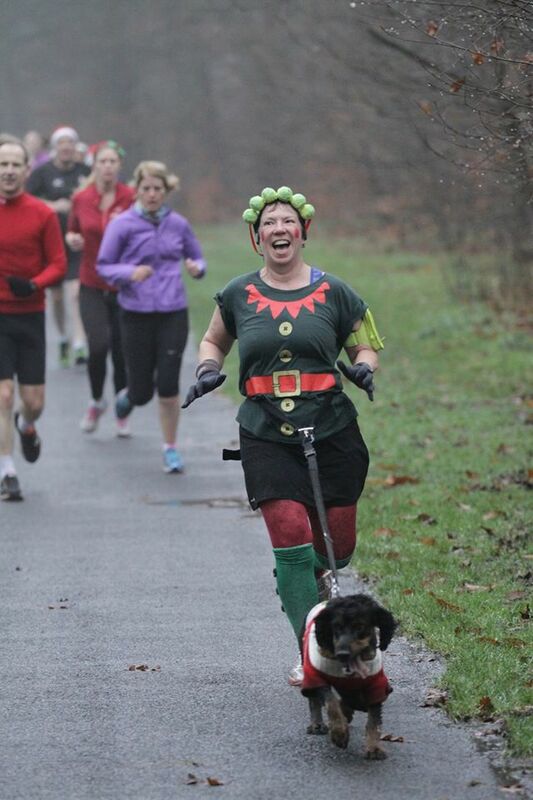 I wondered if maybe a caption would be funny, something along the “elf and safety” line, and came up with “parkrun is good for your elf”. I made up a sign to pin on my back, and we were good to go! 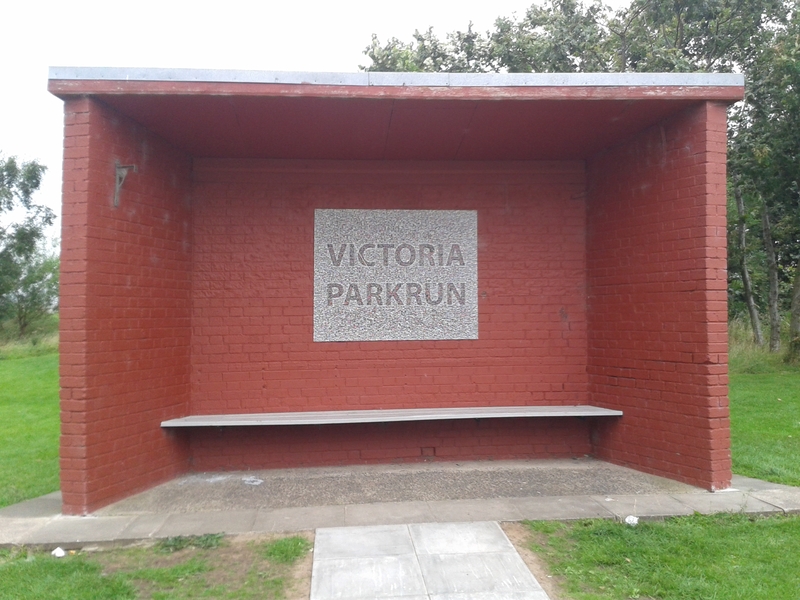 So…..6 parkruns in a fortnight? Let’s see how it went. 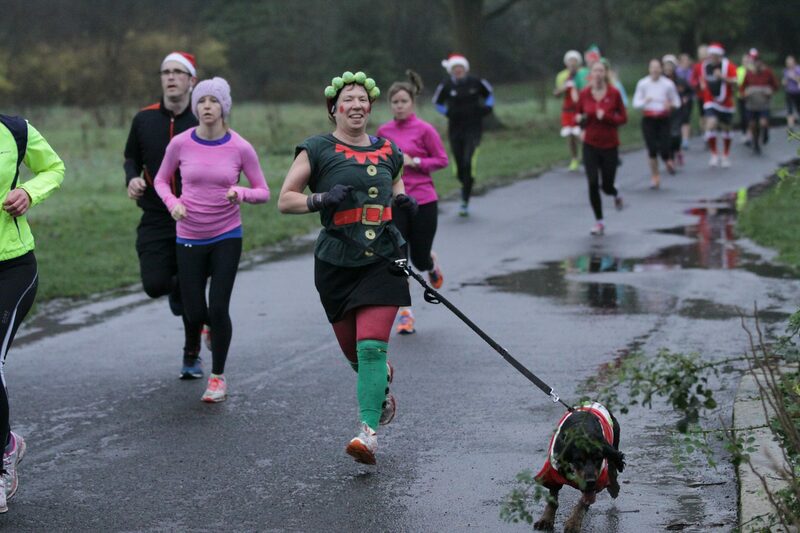 I was so torn on this, the last official Saturday parkrun before Christmas Day. Sports Personality of The Year was coming from Belfast that weekend, and so there would be TV crews, Dame Mary Peters, many many mince-pies at Waterworks, NI’s oldest. There was a Hawaiian themed run at Carrickfergus, which was tempting, and some other local runs were encouraging fancy dress. Or should I go to Falls, the next on my list of “times I think I can beat”? But it was also a “dashing through the snow” type day for me and my time was a scarce resource: I had to go and visit the in-laws, and then be in Bangor for a Scottish dance dem at 2.30. So I opted for the closest fancy-dress one at Queens, since a TV crew always means things over-run, and anyway the parking at Waterworks is terrible. Conditions were good, a bit windy but dry. Lots of super fancy dress costumes were in evidence, and Minnie’s jumper was much admired. 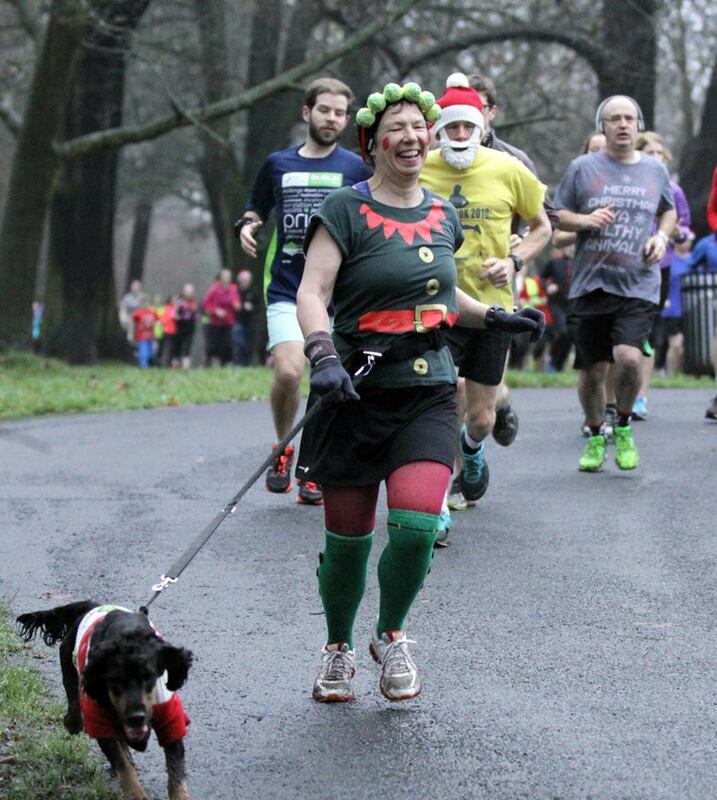 There weren’t too many photographers about, but a lovely lady called Breege (with her gorjus doggie in its tinsel collar) took an action shot of us, and came up to me afterwards to get my email address. Time: 25:54, annoyingly a bit off my 25:32 best time here, but still nice to sub-26, while able to chat to the “undertakers” guys in their black 100 shirts (not jealous at all, no, no) who recognized Minnie from Waggy Races. 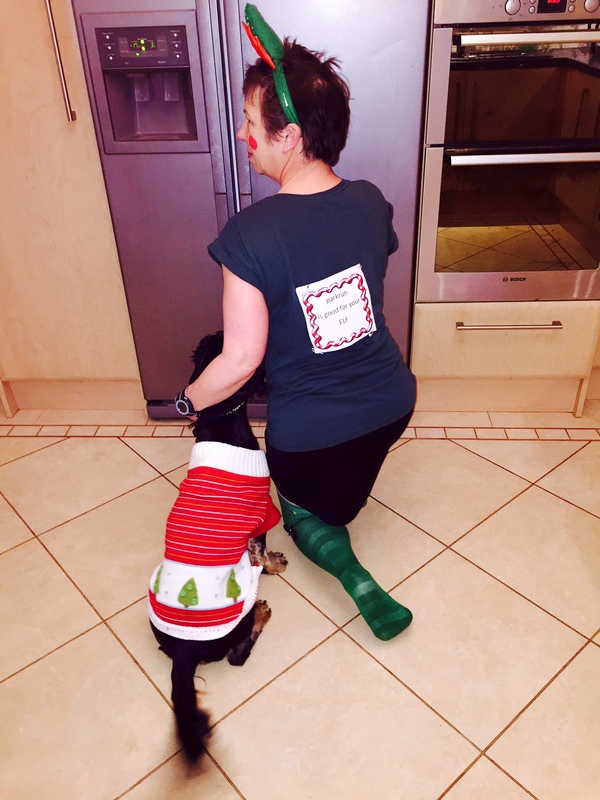 Running on Christmas Day, was I quite mad? Well, possibly. There were a number of options available – Belfast Victoria was enticing with its 10 o’clock start time! But I wanted to do something as a family, and bring my paparazzi husband and other dog with me. Max is a hyper-sensitive Weimaraner, and while he has no problem with running per se, he has huge anxiety problems with crowds, noise, other people, other dogs, applause, high-fizzy vests….So we knew this would be an issue, but at least at City Park there’s plenty of escape spaces to retreat to. Since the elf headband had been a bit tricky to keep on my head while running, I turned my sprout necklace into a sort of crown, which allowed me to make plenty of “I’ve put the sprouts on!” jokes. The weather was murky and misty, and with the outside temperature at 2 degrees, there were even some icy patches on the course. But it is a lovely run, it was over a year since I’d been here, and I’d forgotten how beautifully flat this single lap of the lake is. 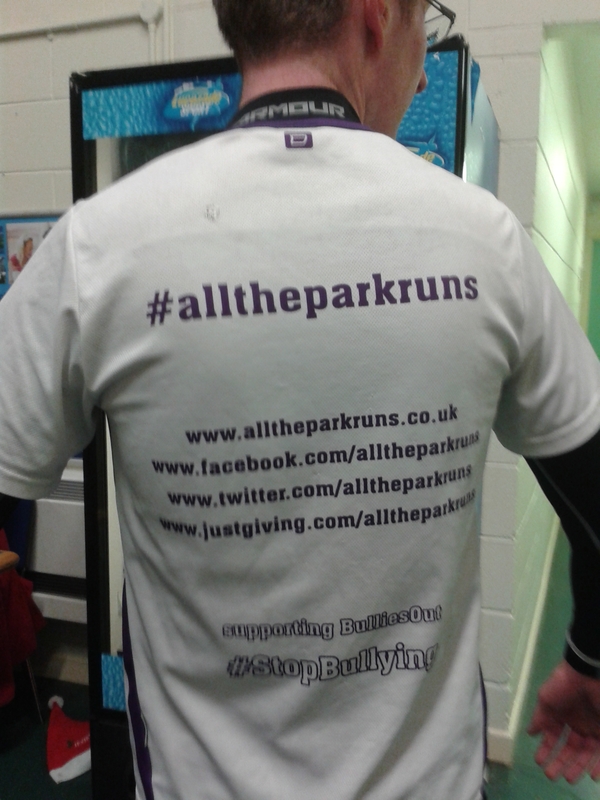 For a large part of the run I was tailing a guy wearing a T shirt that said #alltheparkruns. I couldn’t get close enough to read it, or to see which parkuns it meant. I overtook him on the final stretch , and afterwards shook his hand. 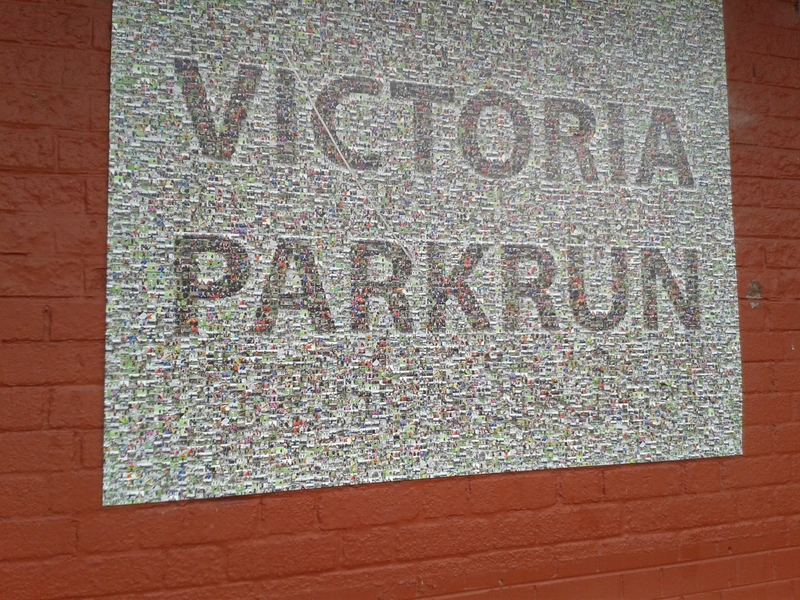 When we were inside doing the scanning, I showed him my #iverunallthenornirnparkrunssoihave shirt, and Pete told me about his charitable fundraising plans to do over 300 different parkruns in the next 10 years. Now that’s forward planning! He was going to Armagh the next day, to run with his nephew, who’d be doing his first parkrun. Time: 25:37 yay, a PB! Despite the black and white tights falling down…. Boxing Day dawned, without TOO bad a hangover. 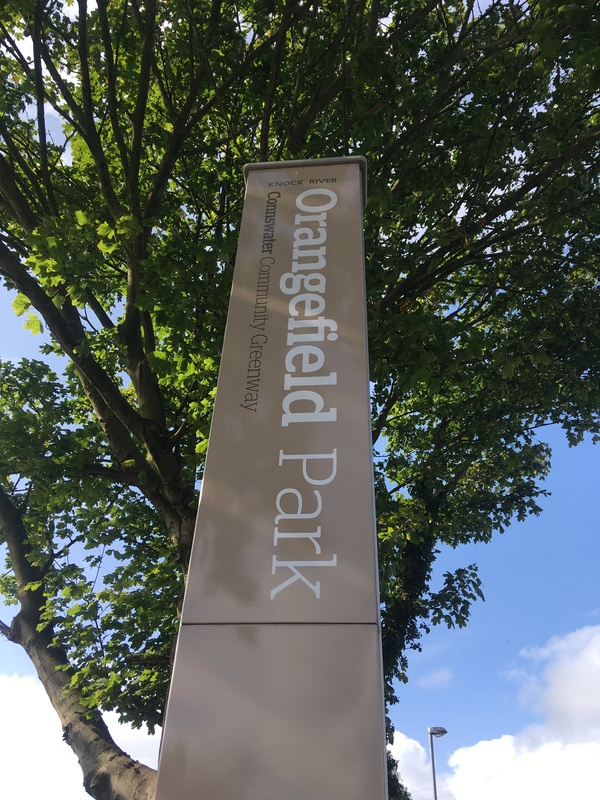 We’d put our names down to join the Santa Dash taking place at Belfast’s Ormeau Park – I think I was last here for the half-marathon in September! I toyed with the idea of putting Minnie in her snow-trimmed red and white 50 cloak, but in the end, went for the jumper – which got mentioned in the pre-run brief! 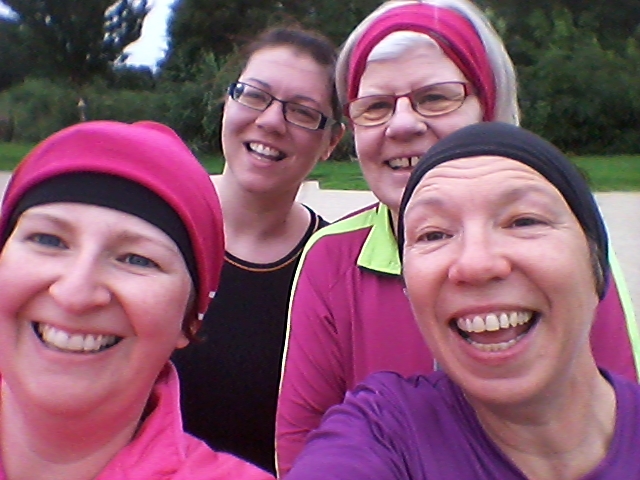 The sprouty headgear was also a talking point, the running went well, despite flooded parts ( I just ran through them on elfin tiptoe). The crowd was very friendly and chatty, and the borrowed gazebo was useful for the focal point of post-run-tea-and-buns. I swapped the too-small black-and-white tights for a pair in red. I have to say a huge thank you to Mark Ramsey, who took a staggering 1,000+ photos of the day itself, and it’s wonderful to have access to action shots like these. Time: 26:06, a PB, though only 3rd in my age-category! 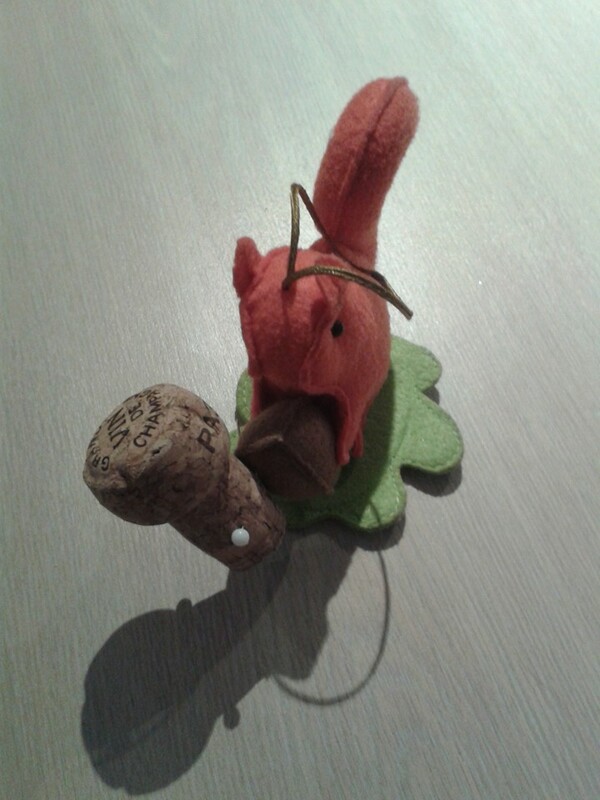 Christmas out of the way, it was time for New Year celebrations, and lots of champagne! There was a yellow warning of snow and ice, and I took it easy on the winding cross-country road to Comber, which is a flat course consisting of 4 figure-of-eight loops. 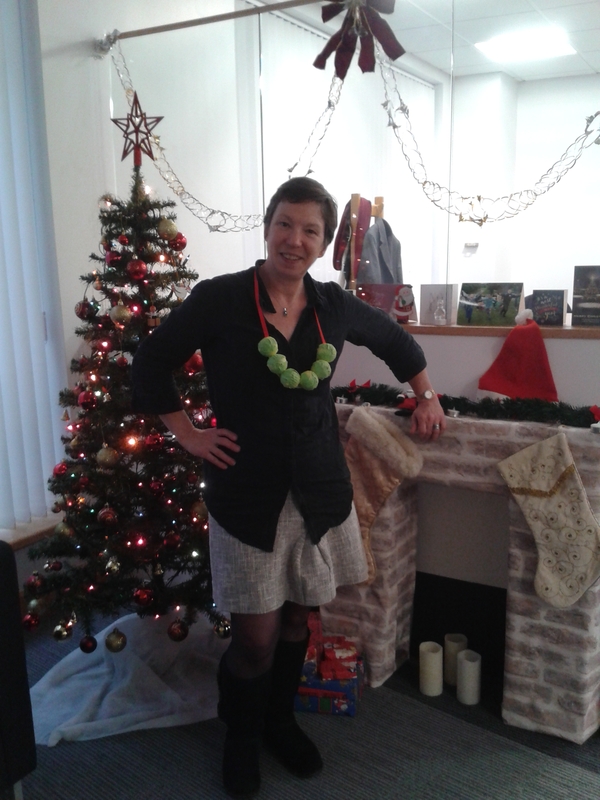 I’d gone for a Hogmanay theme, and was wearing a tartan sash, and carrying a giant champagne bottle and a plastic glass. I have 2 sashes: one is in a “weathered Ulster” pattern, which is quite a dark brown. I didn’t feel it would show up very well in pictures. So instead I took the “Titanic” tartan one off my dancing dem white dress. My husband wore a kilt in this tartan for our wedding at Gretna Green, and it was designed by local historian Clifford Smyth. I attached a tartan bow to Minnie’s collar. 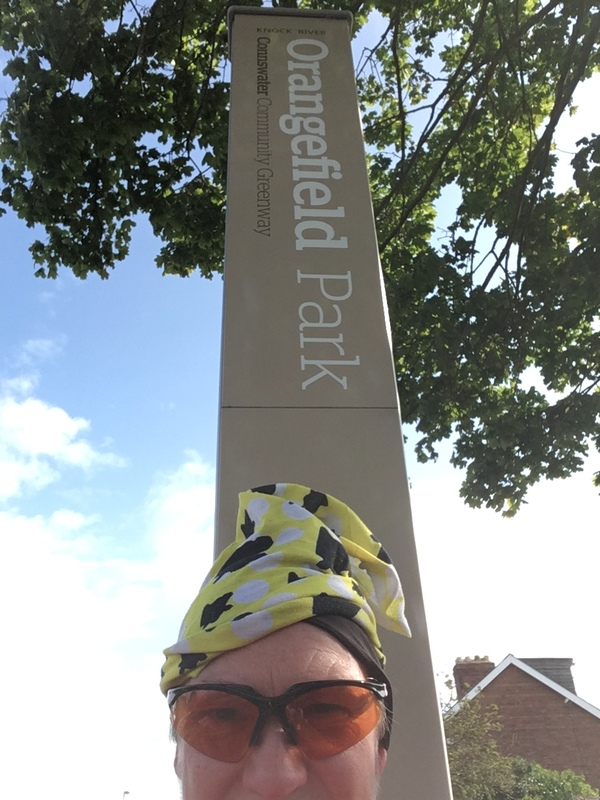 It was a very cold morning – I was glad I’d put on a long sleeved layer under my Jog Lisburn top, and some leggings under my skort. The paths were pretty icy at points – if I’d been RD I might have considered cancelling. But it was runnable with care. I did start off with the champagne bottle and glass, but cast them aside after the first lap. Given the slippery surfaces, the added obstacle of carrying props, and the fact that I’d stayed up till after midnight to see in the New Year, I shouldn’t have been surprised that I didn’t quite manage a PB, though a time of just over 27 was satisfying enough. A quick glass of water and a chocolate in the hospitality centre, and it was time to head to number 2. Lots of people were doing the same, in fact I think there was a mini-bus which went from Comber-Stormont. 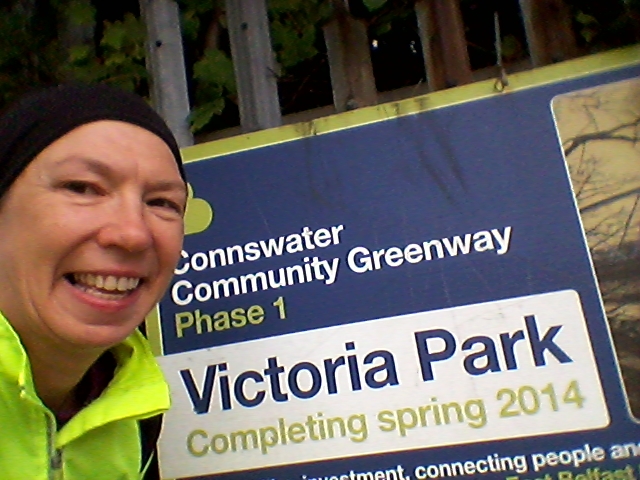 I was glad I’d picked Comber, as the other early alternative at Waterworks WAS cancelled due to ice – a very tough decision for the RD to make. As we arrived by the familiar gates and long drive, the heavens opened and it absolutely poured. I parked by the hotel across the road, and stayed in the car as long as I could, but I knew I wanted to take some photos with the other Jog Lisburn crew, so we made our way to the briefing point. 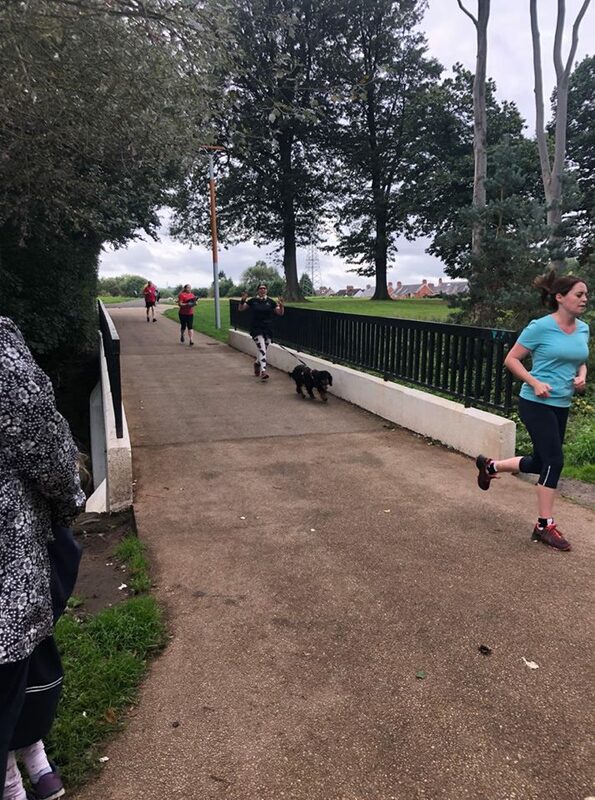 I was greeting lots of friends form parkruns near and far – Ronan, who I’d met in Derry, and Des, a fellow member of the “IverunallthenornirnparkrunssoIhave” club (and co-incidentally, another member of the dog-called-Minnie club). 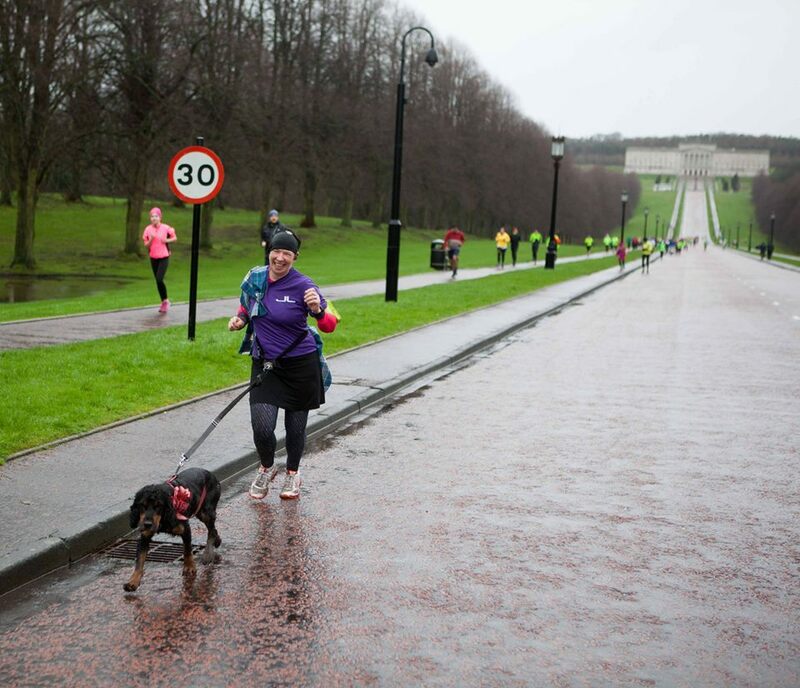 One of my blog readers told me excitedly that he only has 2 more events to attend before he’s done all the NI parkruns, and we waved to waggy pals Alfie and Dudley. 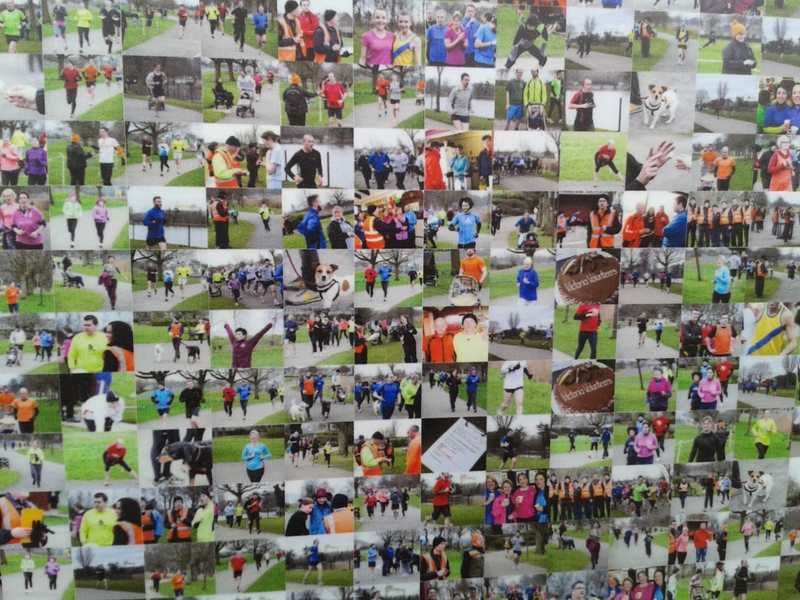 We managed a quick Jog Lisburn group photo, though the champers bottle is a bit obscured. I later learned that some of the other JL ladies did indeed come to Stormont, but on seeing the rain they didn’t get out of their car! The turnout was huge, rain or no rain, and it was quite a sight to see the start line half way up the famous Prince of Wales Avenue. I struggled a bit to get my Garmin reset in time, and Minnie was being a bit noisy, but once we were underway the run itself was fun, though VERY muddy! I was tired and hungry, and even Minnie wasn’t attacking the hills with her usual gusto. I felt my pace just draining away, and we crossed the line in just under 30 minutes. There were queues for the finish tokens to be given out, where it’s important to stay in order. Once those were safely acquired though, there were shorter queues for the scanners, though with only 2 being used this was causing a backlog. When the official results came out, it appeared that an even 500 runners had been processed. 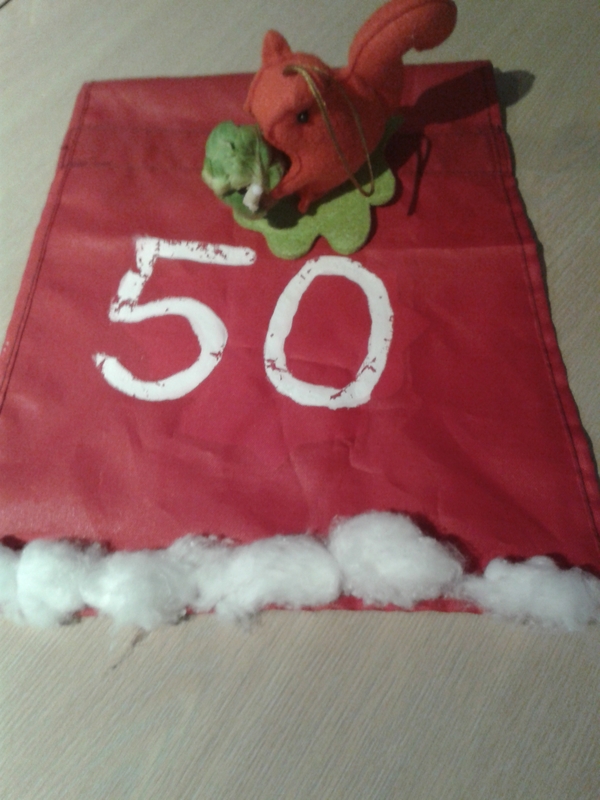 I suspect there were actually more than this, but that the stopwatch and finish tokens had proved limiting factors. 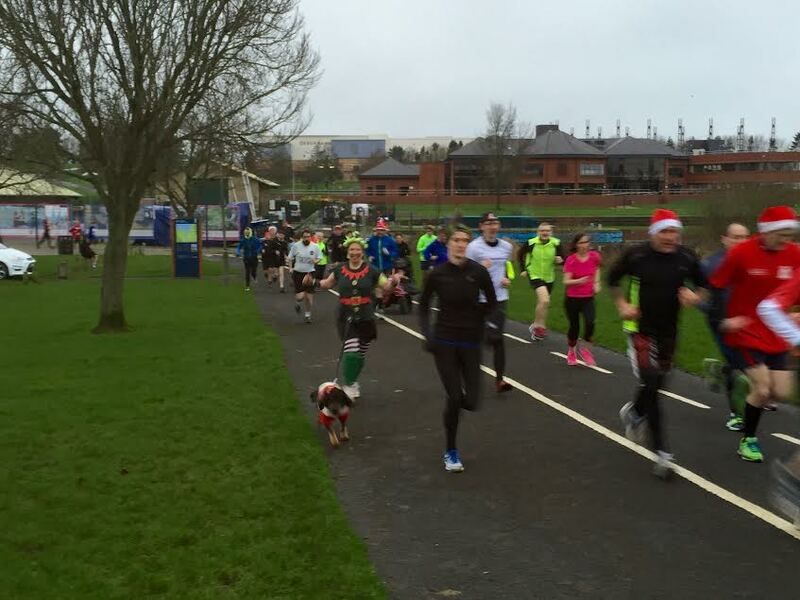 Anyway, it was a record breaking attendance for a NI parkrun, and the atmosphere was very cheery and upbeat. My intention had been to finish the fortnight with a trip to Falls, hopefully to get a new PB. But a Facebook appeal for volunteers could not go unheeded, and I decided to do my duty and go along to Wallace, for their first run of the year. New Years resolutions were clearly taking effect as there were over 20 newly registered runners that week, and on scanning duty I had to deal with more than a few people who hadn’t yet registered, or who hadn’t printed out their barcode. As well as another clump of runners whose barcodes were too soggy and wouldn’t scan. I’d knitted some cosies to keep the scanners warm, as they don’t like cold or rainy conditions. 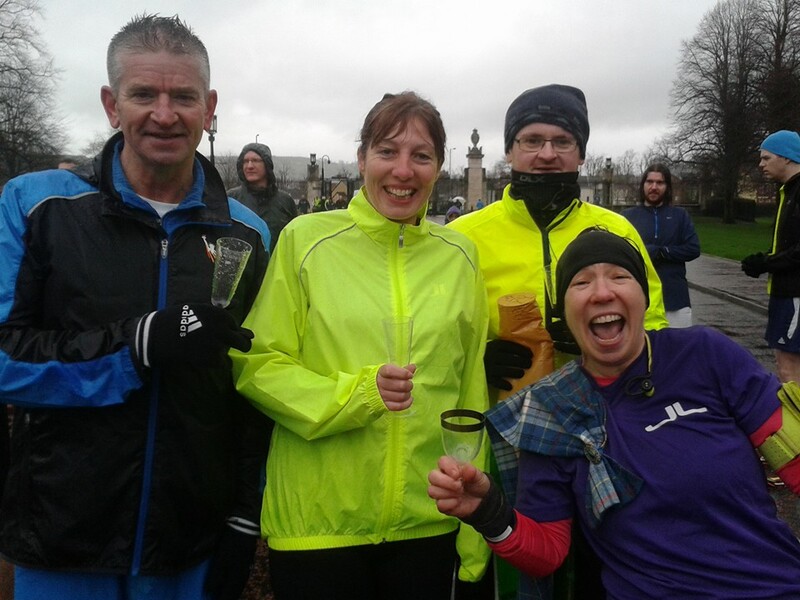 Well, overall the Christmas and New Year runs were a lot of fun, but now I have to go and wash and iron my tartan sash, and re-attach it to my dancing dress! 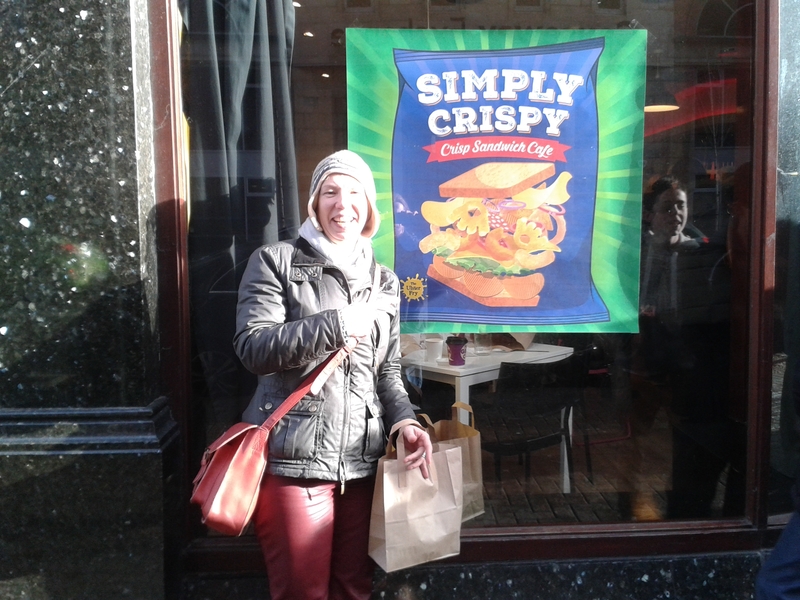 These were just a few of the comments that greeted the opening of the world’s first crisp sandwich shop in Belfast. The idea itself had started as a spoof on the Ulster Fry website, but a pop-up cafe on Bedford Street decided that this was daft enough to work, and set about making it a reality. It helps to remember that a valid reason for doing anything in Norn Irn is “for the crack”. 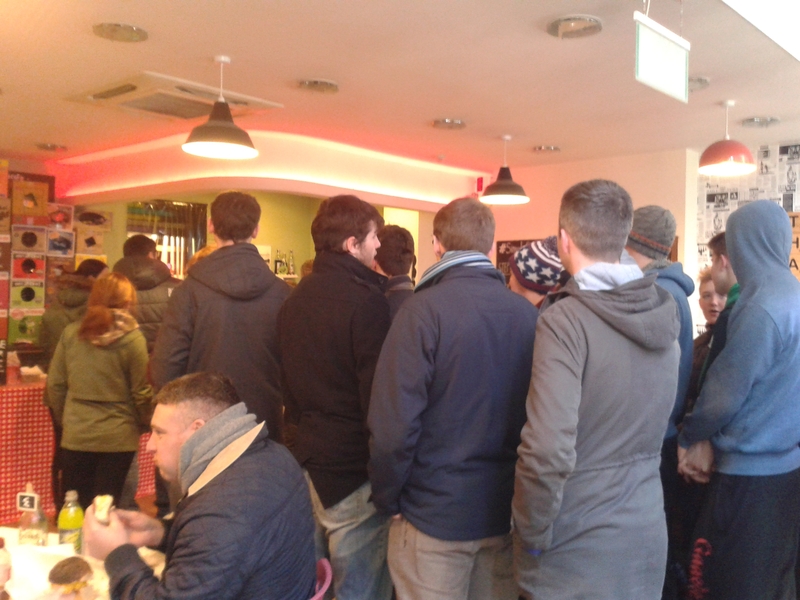 When I arrived on Friday lunchtime, the queue was out the door. Granted, not as bad as it was on Monday’s opening day, and the wait was not unreasonable, about 10 minutes. 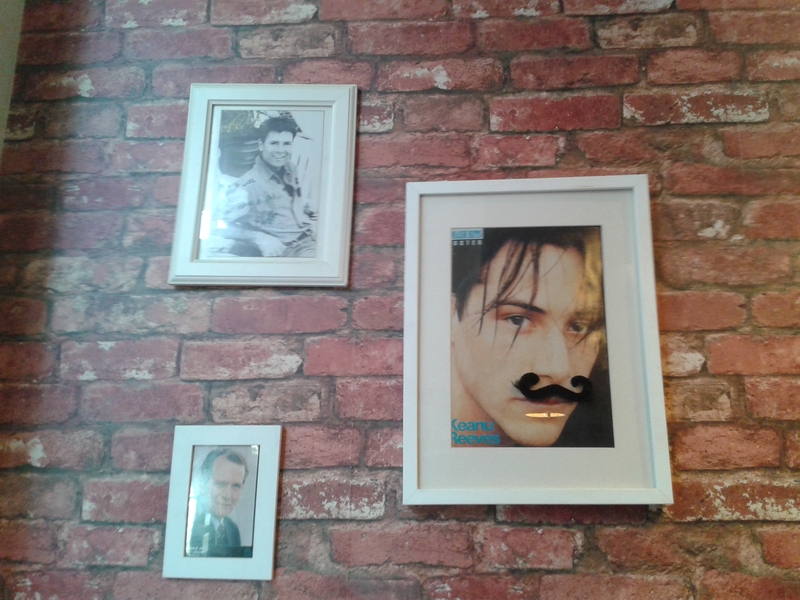 To pass the time we looked at the photos decorating the walls. There was one of a teacher from Grange Hill, under Cliff Richard. There was one from Roy Walker saying “Your food’s good, but it’s nat right!”. 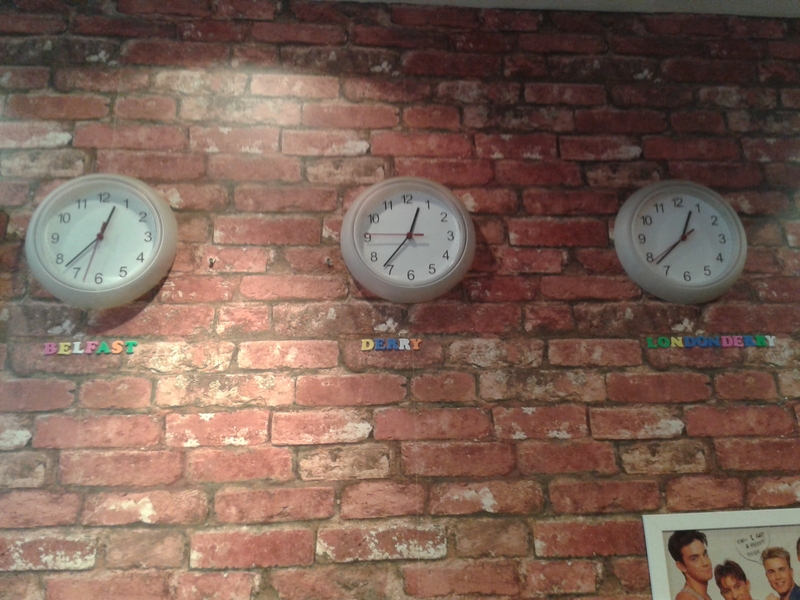 And there were 3 clocks showing the time in Belfast, Derry, and Londonderry. 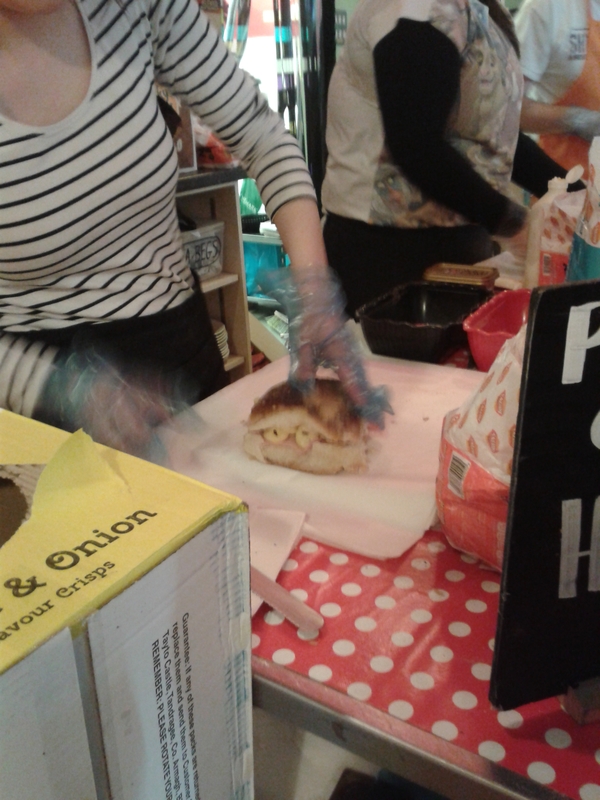 First, choose your bread: a Belfast bap is the most popular choice, but it is a mahoosive sized roll with a crusty top. The dials on my internal carb-counter were already spinning out of control, so I applied the “less is more” mantra and rejected the extra thick softee white bread in favour of a Knutty Crust. 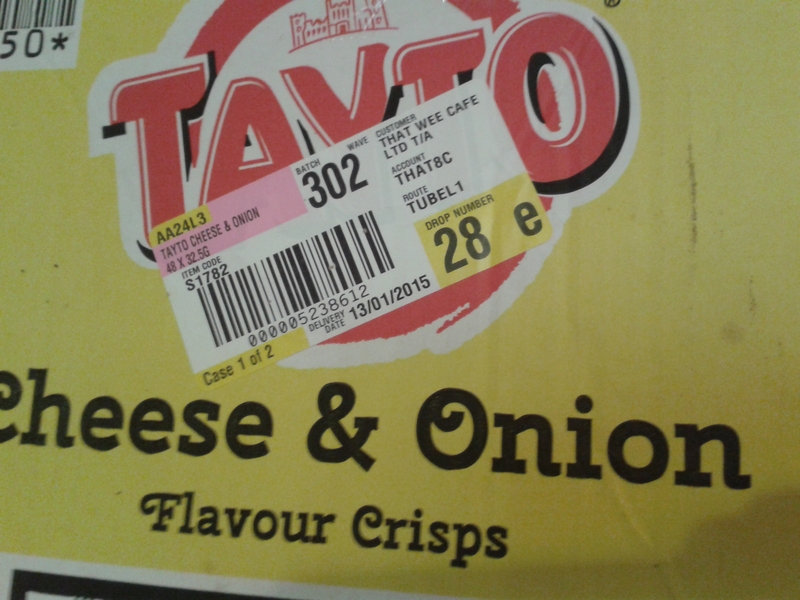 From the available 20 or so varieties, I opted for by far the most popular crisps, local heroes Tayto Cheese’n’onion. These are a crisp of legendary significance, the banners greeting you as you arrive at Belfast’s George Best City Airport are decorated in its signature colours, with safety advice dispensed from Mr Tayto himself. Ex-pats weep at the memory of those yellow bags. I added a slice of ham, just as a nod to the need for some protein. 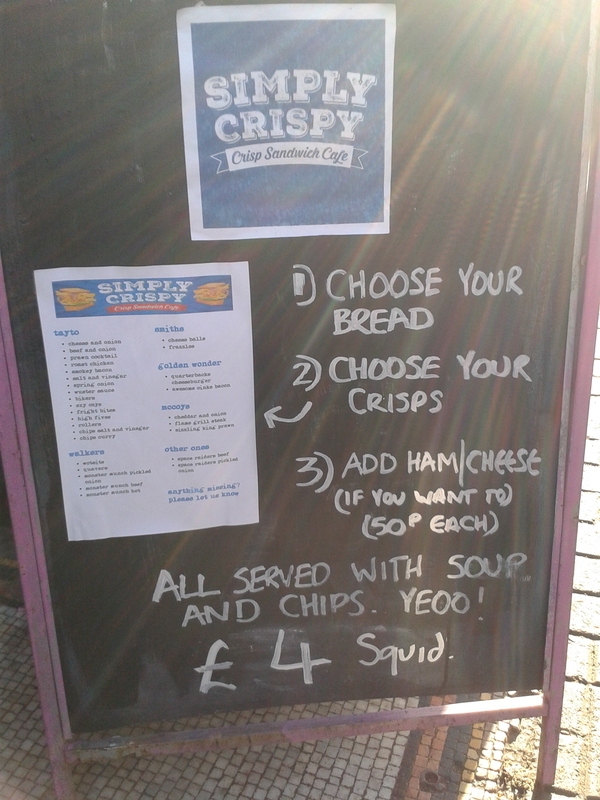 The meal deal additions of chips (fries) and soup brought it to £4, with an extra 50p for the ham. A slice of cheese can be added instead. 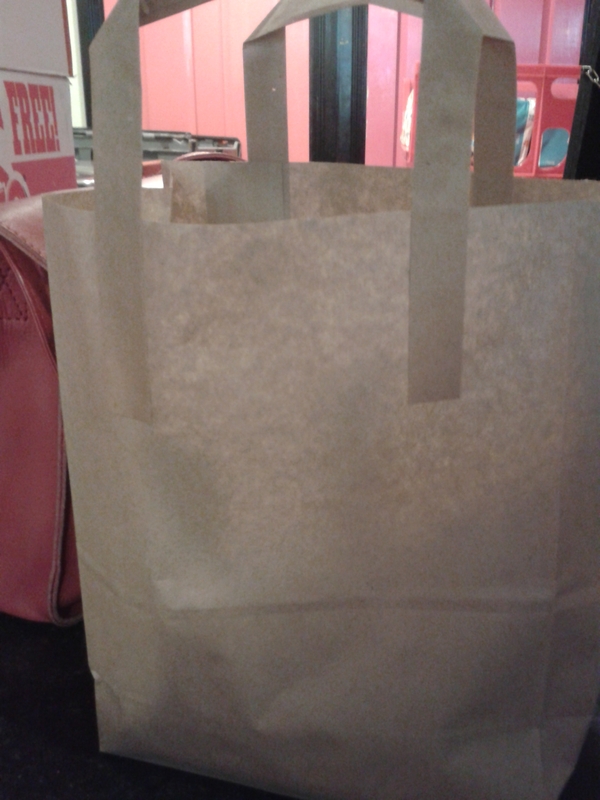 A bag of crisps is tipped onto the buttered bread. 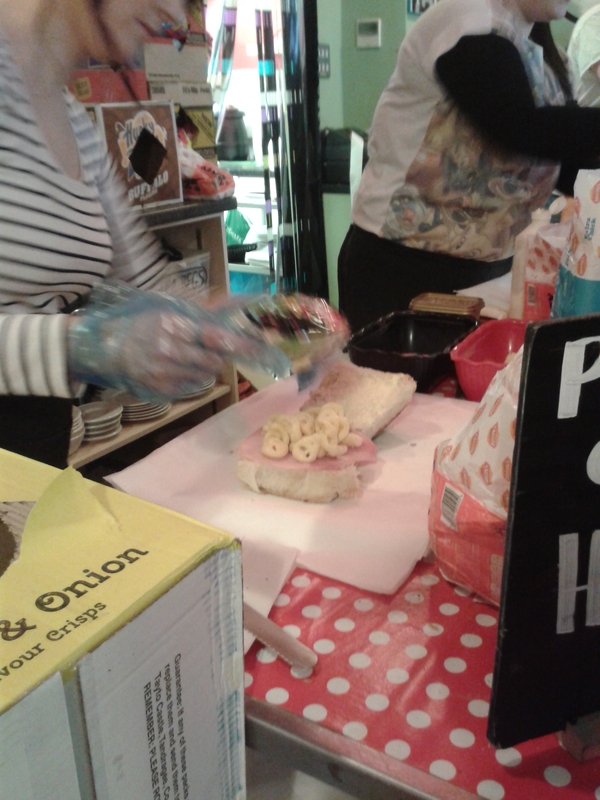 The squishing action is all important when producing the resultant sandwich, I imagine the staff have to go through a rigorous training procedure in order to get the amount of force just right. Places at tables were at a premium, but we did manage to elbow the photographers and journos out of the way to secure some space and settle down to enjoy the experience. That first bite, soft bread gently caressing crunchy crisps, the overpowering flavours of the latter matched by the blandness of the former – it really is a winning combination. I could say something about “mouthfeel” but you’d only accuse me of being all poncey. The chips were not really necessary,and the soup wasn’t that exciting. So next time (and there WILL be a next time) I’ll just have the sandwich. I also enjoyed the Led Zeppelin playing in the background, which helped with the nostalgic feel, and memories of school packed lunches…. Has the world gone mad? Quite possibly. But maybe what the world needs is a bit more madness like this. It’s impossible to have lunch here without a smile on your face. 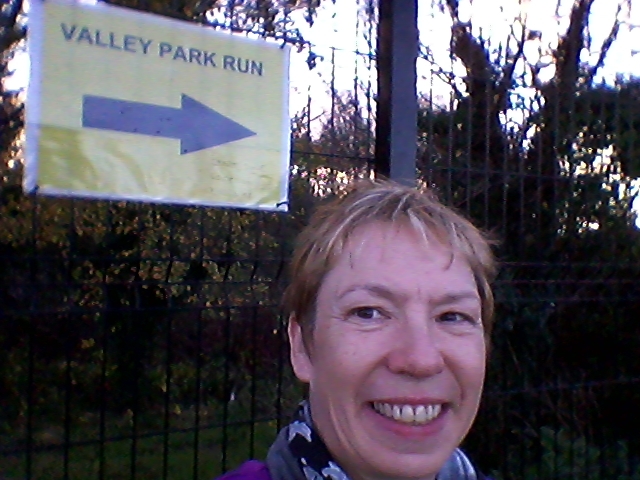 At the time of writing, Valley is the newest addition to the NI parkrun family, and I joined them on a clear crisp November morning for their 16th event. 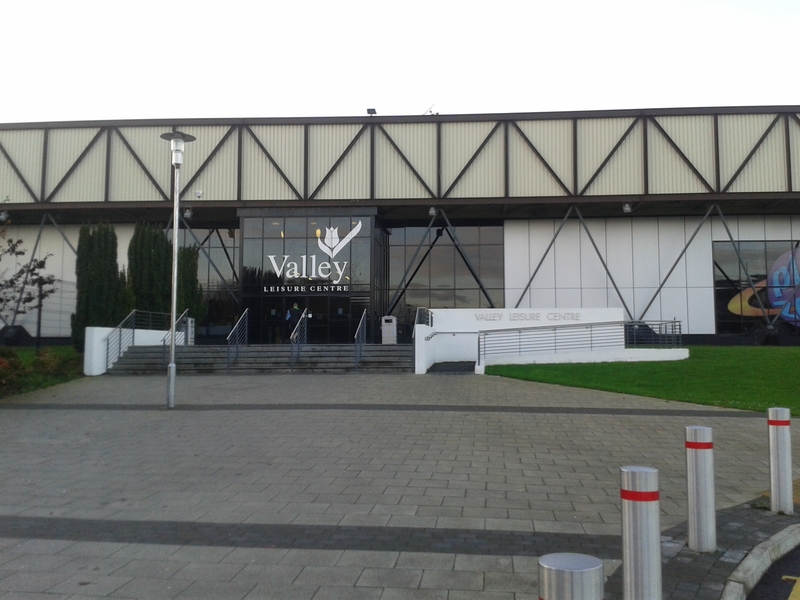 The Valley leisure centre was always known to my little darlings as “the froggy pool” after one of the water slides in the swimming pool. 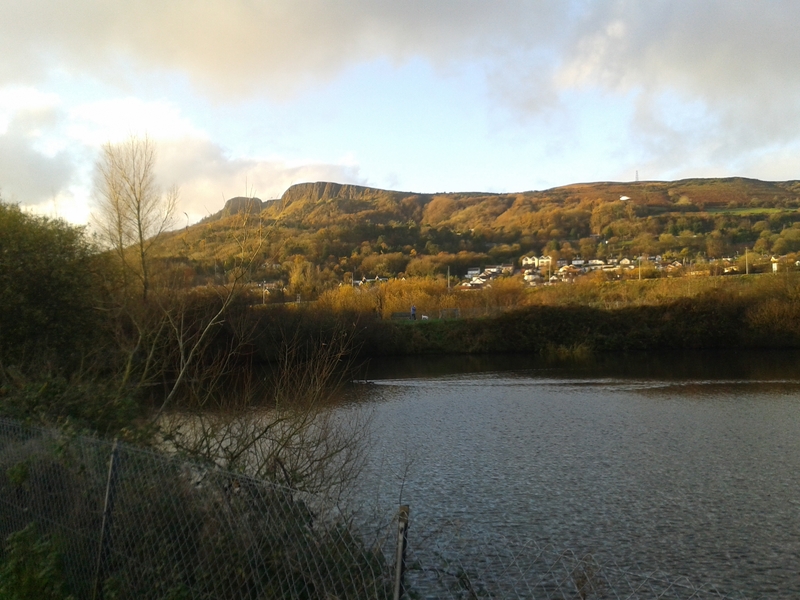 It sits under the towering mass of Cavehill, and has lovely views down to Belfast Lough and the shipyard cranes. 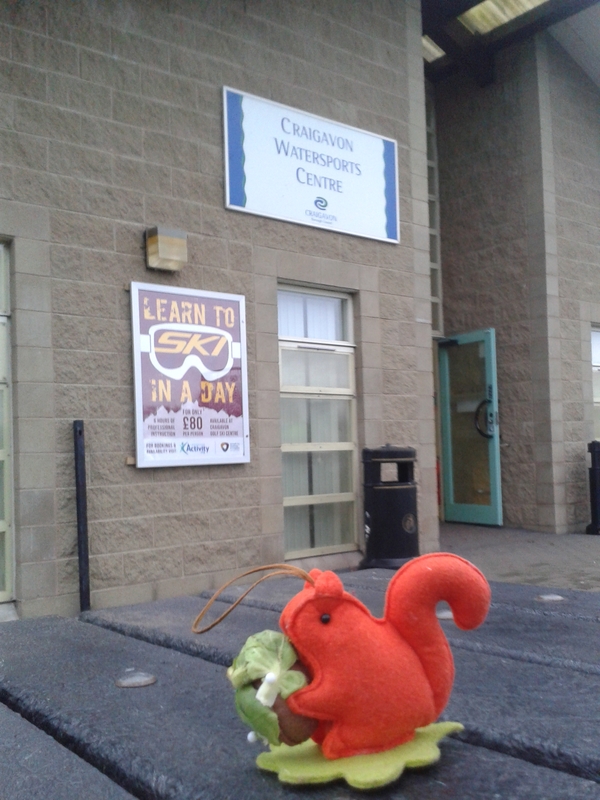 It’s very easy to find, near the Abbeycentre, and there’s plenty of parking. The start of the run is behind the main building, and signs point the way. There are toilets in the main building as well as in the smaller centre at the back, where the final scanning is done. Fancy that, being able to scan in the warm and dry! The course is 2 laps (always nice, you know when you’re halfway there). It’s on a slope (the clue’s in the name), but not a very pronounced one. It’s on gravel paths all the way round, though they are included to get muddy and puddley. 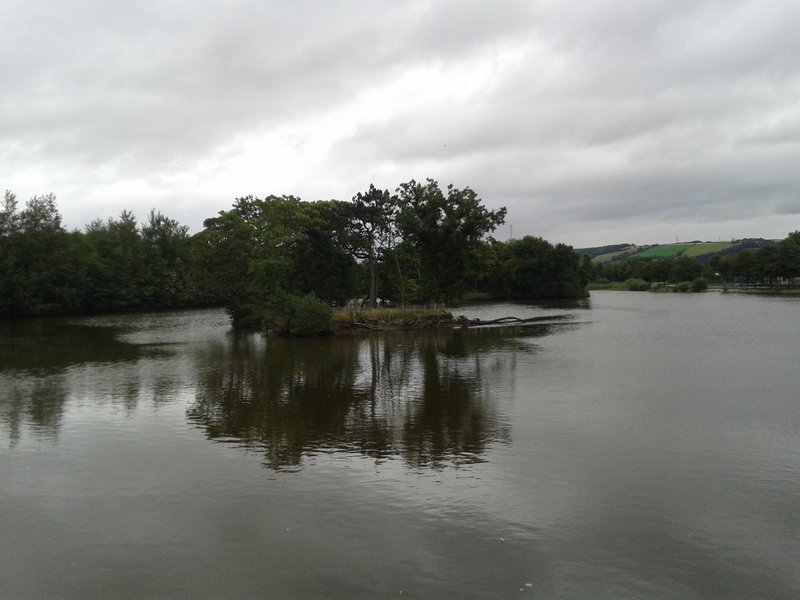 But the scenery is lovely, and there’s a pretty duck pond to skip round. I discovered when I tried to put my car keys in the zippy pocket of my long sleeved shirt, that I’d put it on inside out! Oh, well, that’s lucky isn’t it? I was a little slow pressing go on my Garmin, but all my other equipment was faultless. The playlist I was using was one called “Scotland” rather than my specific “jogging” one, and as my feet flew over those puddles, I almost felt I was flying to “Lift Me Up”, by a Luxembourgian group, ODC. But my biggest smile came when I was finished and driving off in my car to the strains of Jupiter, the bringer of Joy. There were 60 runners that day. I like these smaller crowds, it’s easier to find some uncluttered space to run with Mini on her hands-free leash, and people seem to be a bit chattier and friendlier. 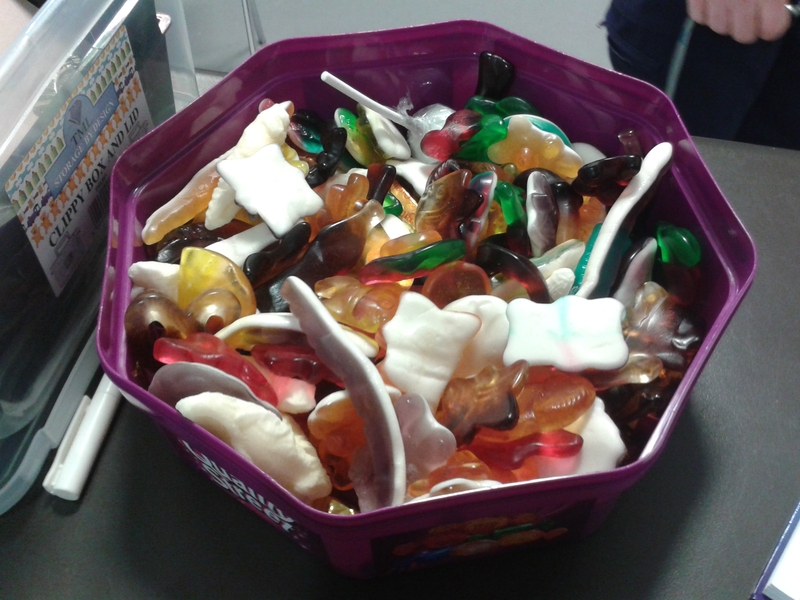 And there was a lovely treat of a box of gummy sweeties at the end – I do think I should ask Haribo to sponsor me! The all important time. I’d been very good all week – I’d had a long run, a hill training session, and a speed run. I’d worked on my core by doing 2 lots of 20 push ups and squats every day, as well as some hula-hooping. I hadn’t had any alcohol on the Friday night, and I’d had a light breakfast of Greek yoghurt and buckwheat muesli. Did this all work? You betcha! 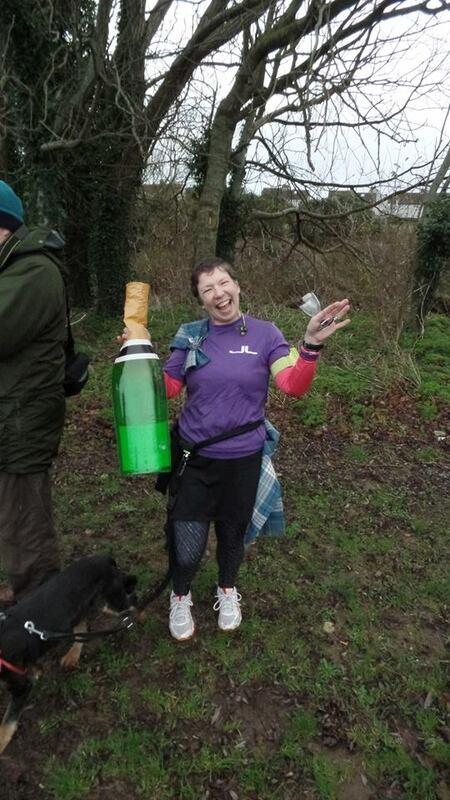 I romped home as 3rd lady (best gender position), in position 24 (best actual position), at an age grading of 69.20% (best ever), and a PB time of 25:10. 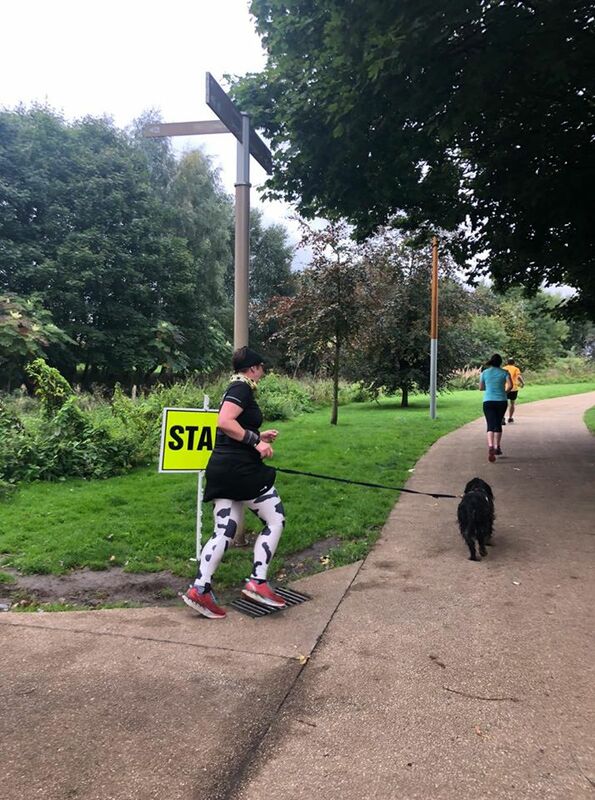 Valley has pacers, which I’ve never seen before at a parkrun, and I want to say thank you to the 25 minute runner, whose heels I was clipping on the final 100m. A great morning. 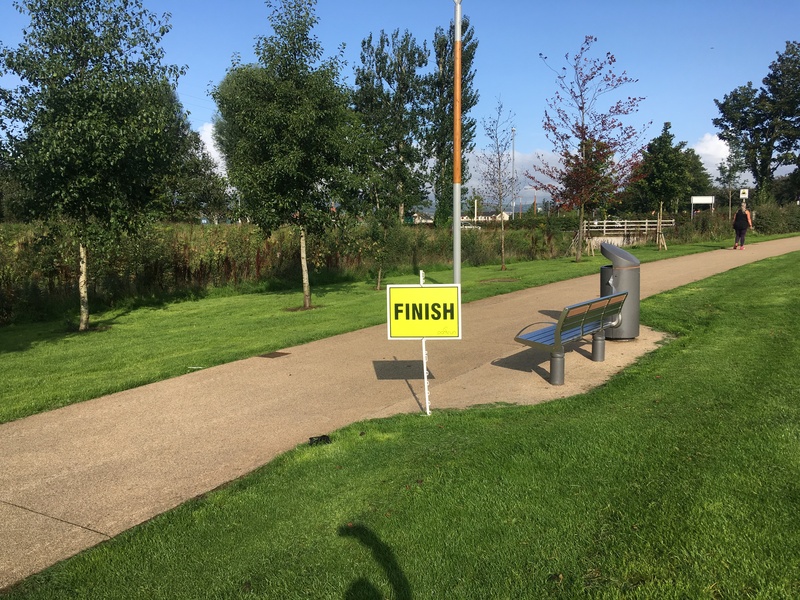 Victoria Park in Belfast hosts one of Norn Irn’s oldest parkruns, though it’s had a bit of hiatus recently with ongoing improvements being made to the park. 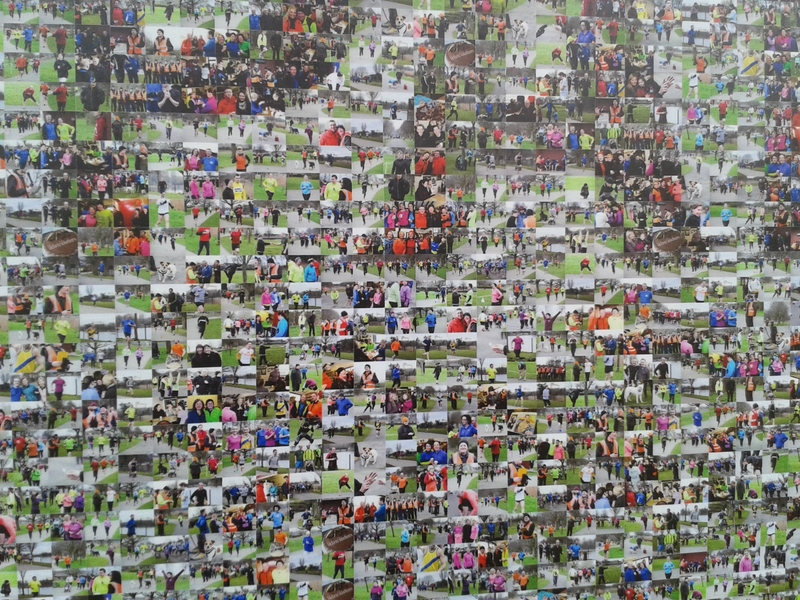 I only realised on a later visit to the park just how detailed all the improvements are, and that the sign in the shelter is made up of lots of little photos of parkrunners – impressive or what! Some of my Jog Lisbrun friends like to do a bit of parkrun tourism once a month or so, and I agreed to join them on their jaunt to Victoria. 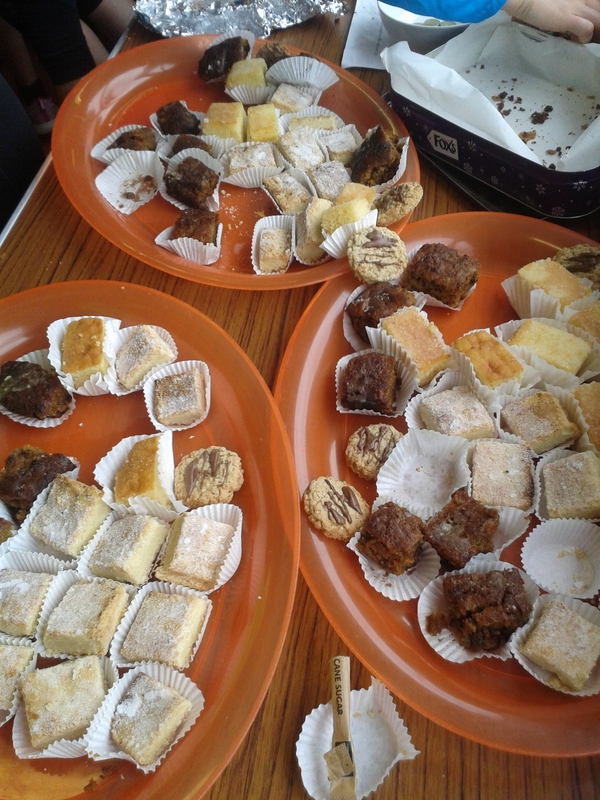 The promise of brownies was an added incentive! 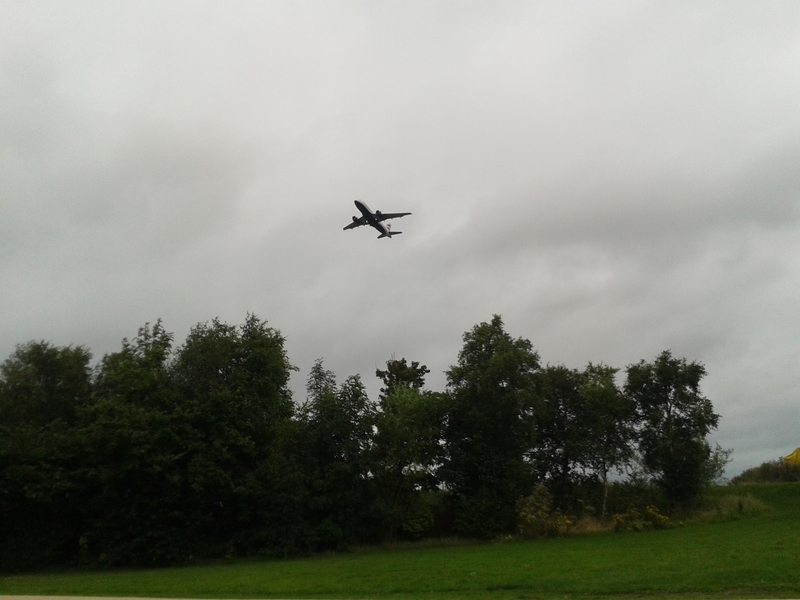 Access: The park is right beside the runway of George Best Belfast City airport – in fact if the wind is in a certain direction, the taking off and landing planes are so close overhead that it’s impossible not to duck. 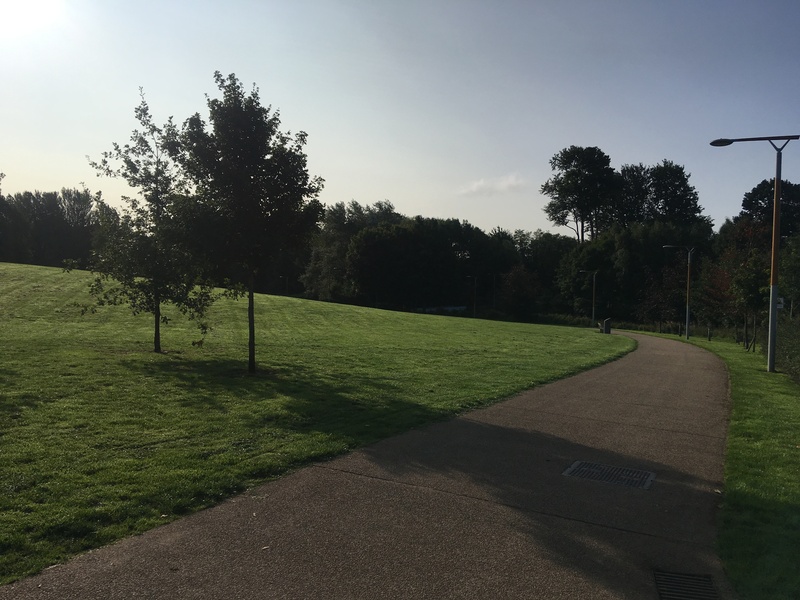 It’s also across the road from Sydenham station, that “road” being the busy Sydenham bypass, below which an underpass leads you into the park. It’s pretty well sign-posted, though first time visitors can be a little unnerved by the back streets of red brick terraced houses surrounding the route. 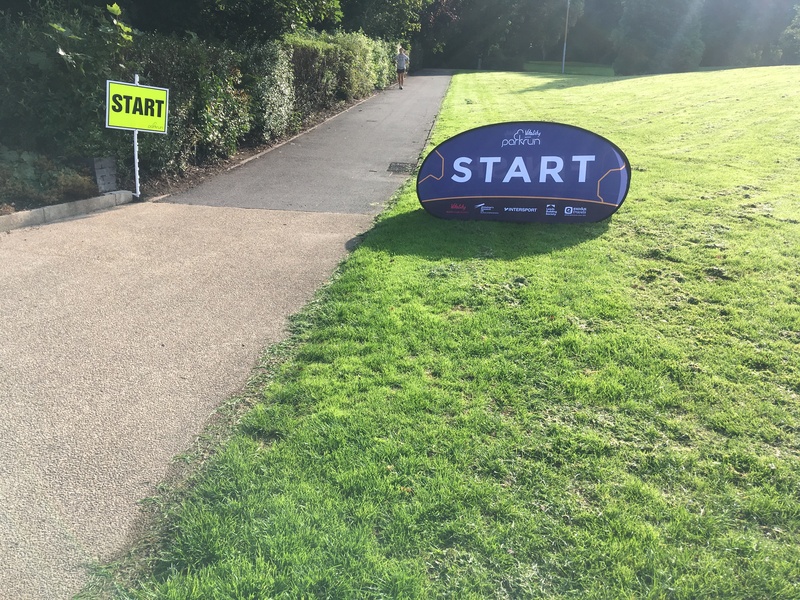 Course: Part of the park’s updating have included new pathways, with parkrun distance signs marked on the way. 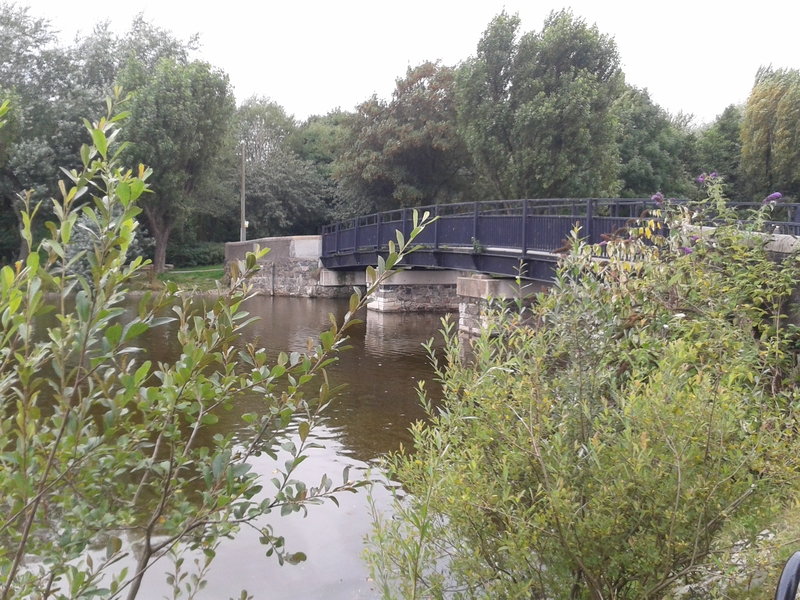 The course is one complete outer lap, one almost all way round, and then cross the bridge on to the island in the centre for a circuit through the trees. 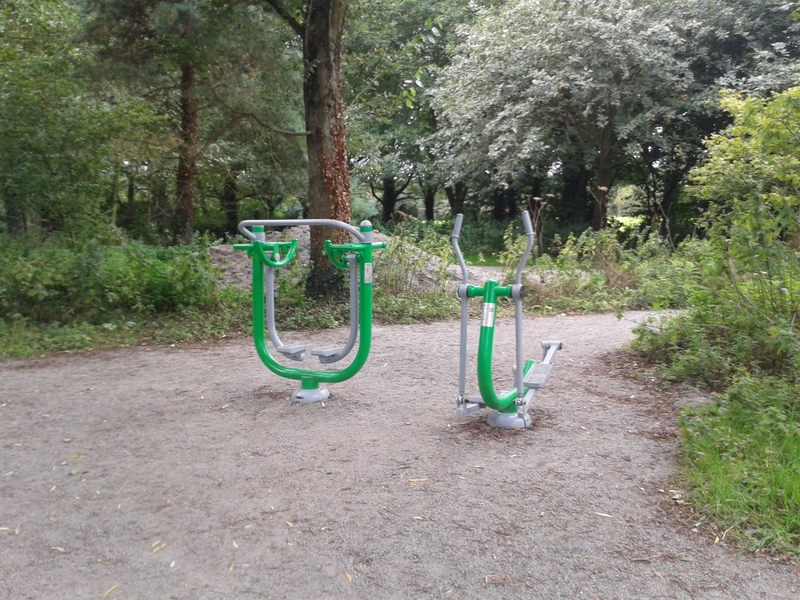 The shade is very welcome, though the gym equipment lurking in various leafy corners was rather spooky. There’s the teeniest of inclines as you turn the corner at the back by the Sam Thompson Bridge, but really, the course is delightfully flat. Gear: MapMyRun performed beautifully this morning, but my trainers felt tight, even though I re-tied them 3 times. Perhaps it was the fact that I was still wearing my ankle support. To be honest, there were no niggles at all from my ankle, and I feel I could leave the support bandage off in future. Crowd: It was a BIG crowd! 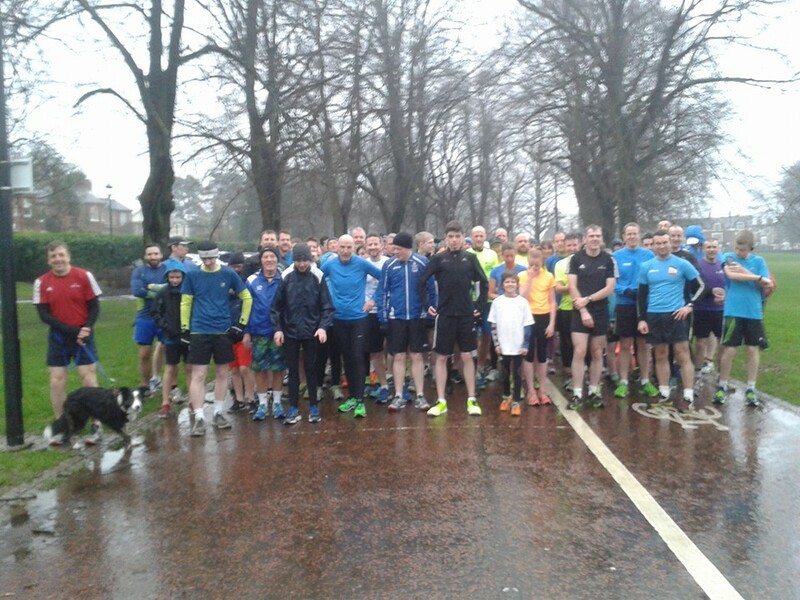 They often attact 150+, but since the closest parkrun at Ormeau was cancelled today, the numbers had risen to well in excess of 200. The park is able to absorb that capacity, though, there was plenty of car parking, loos on site, and not too bad a queue for scanning barcodes. Oddly appropriate song: In the week that my daughter was back home for her 21st birthday, and in the Park where we used to feed the ducks ( we lived in a house quite literally across the road), it was Annie Lennox singing “Precious Little Angel” that prompted a rush of emotion. 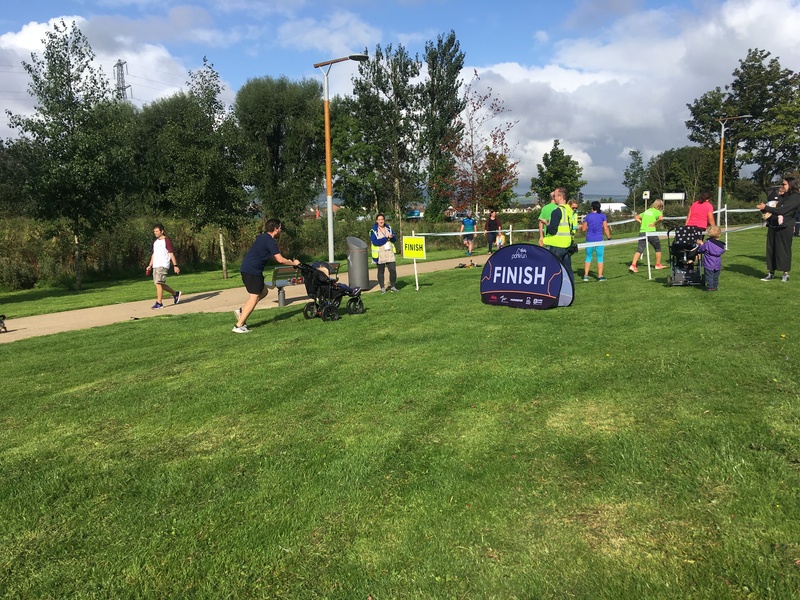 Time: We’d started at the back, as the Run Director had said “dogs and prams start at the rear!” at which Mini barked her displeasure. But it was pretty easy to overtake, slotting into available emptier spots. 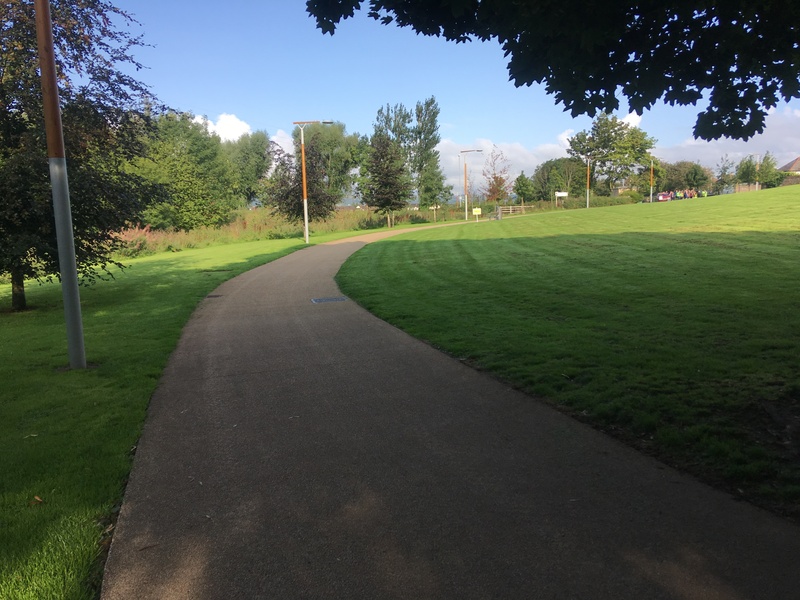 The paths are nice and wide, with ample grassy verges on either side, so we never felt hemmed in. I quickly got up to a steady pace of around 5:20 per km, which would have been close to PB territory, but I slacked off after km 3, and my legs started to ache. 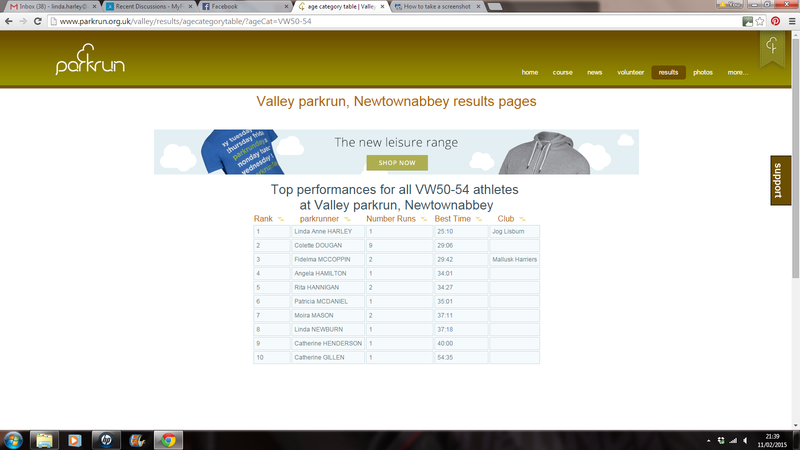 And I’m really going to have to work on my finish – 6 runners must have passed me in the last 200m! But at 29:03 I was comfortably sub-30, and happy enough with that since I’m still not back to full training routine yet. Atmosphere: It’s a busy city park. 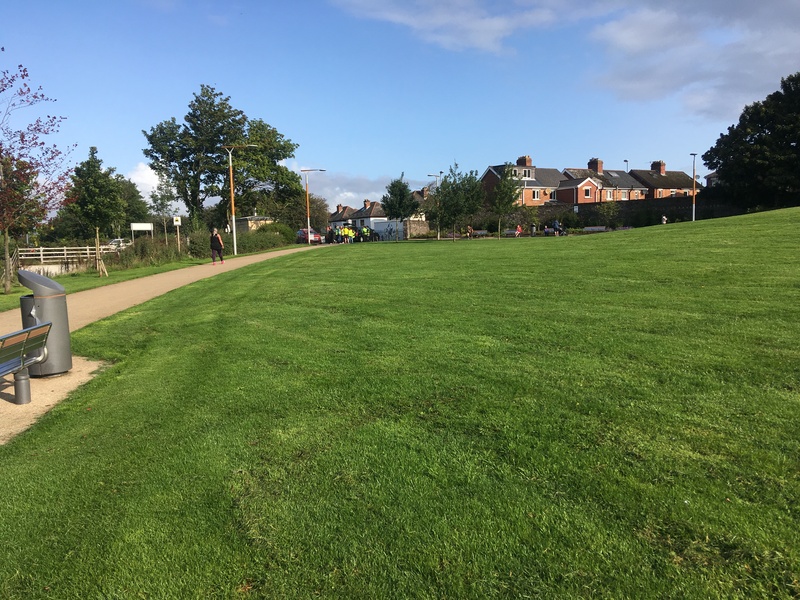 There are still workmen finishing off the improvements, there are lots of dog walkers, and footballers playing on the pitches in the island. 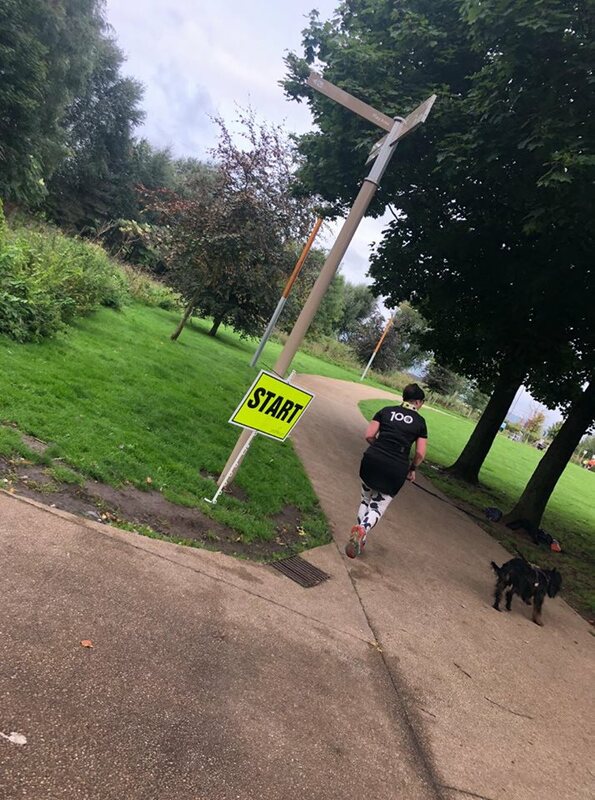 The highlight was undoubtedly one of the best bun selections I’ve ever had at a parkrun, including absolutely delicious gluten-free walnut brownies. Yum!